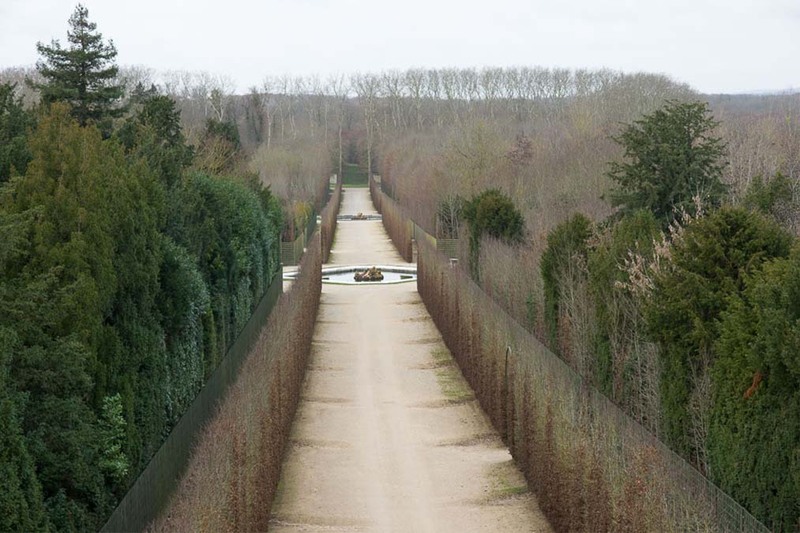 Versailles is gorgeous regardless of the season. 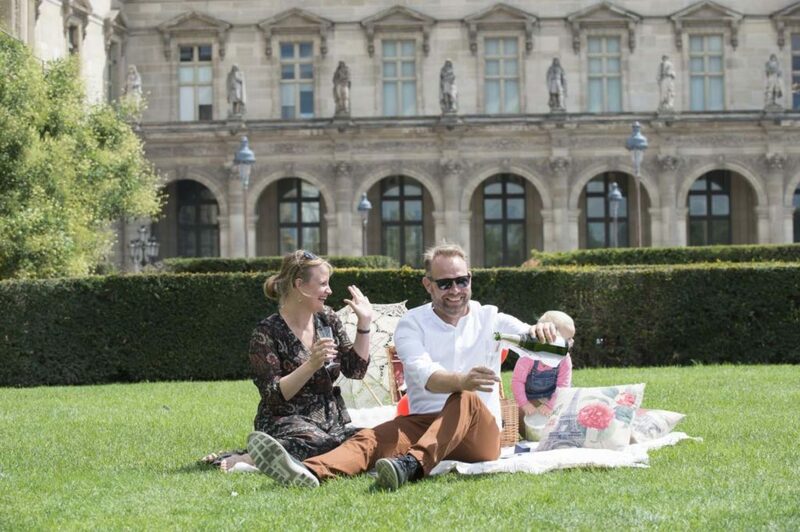 We have organised a few picnics for our clients in its gardens this past season. 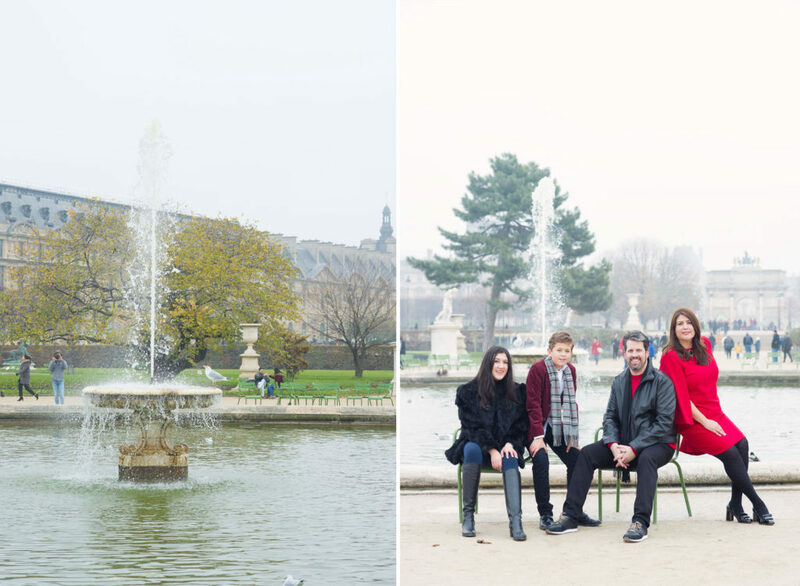 It is always such a blessing to wander around the park. 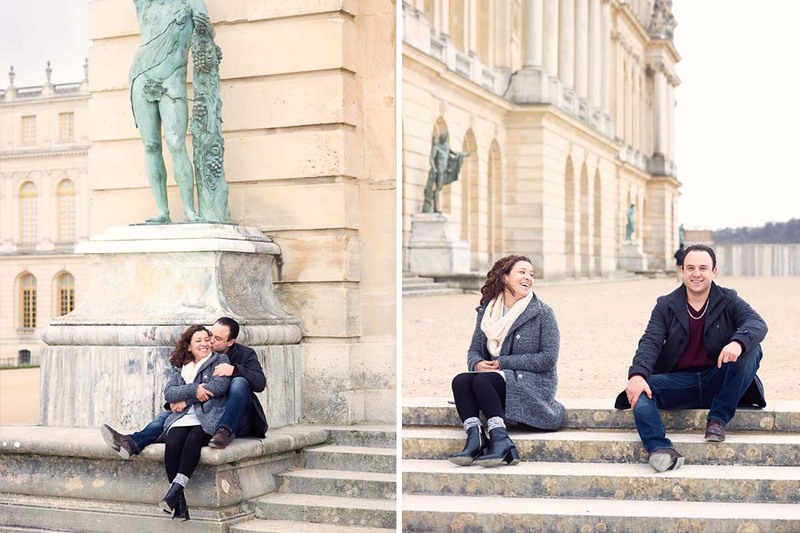 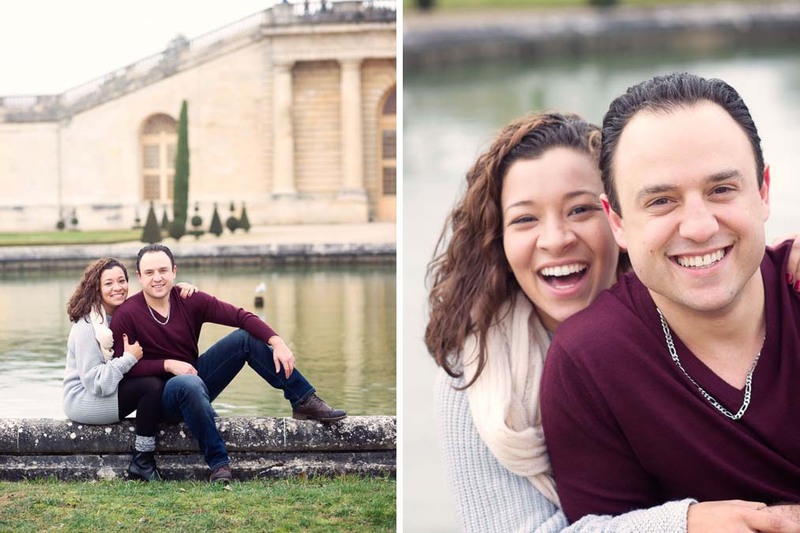 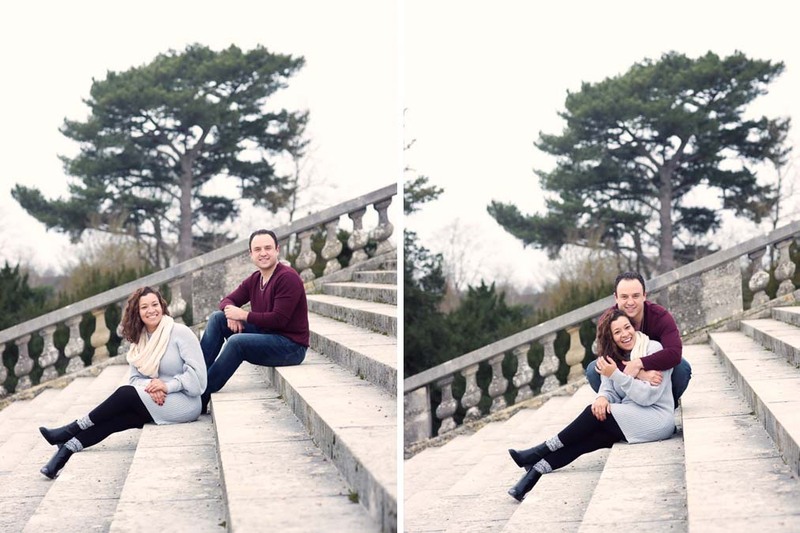 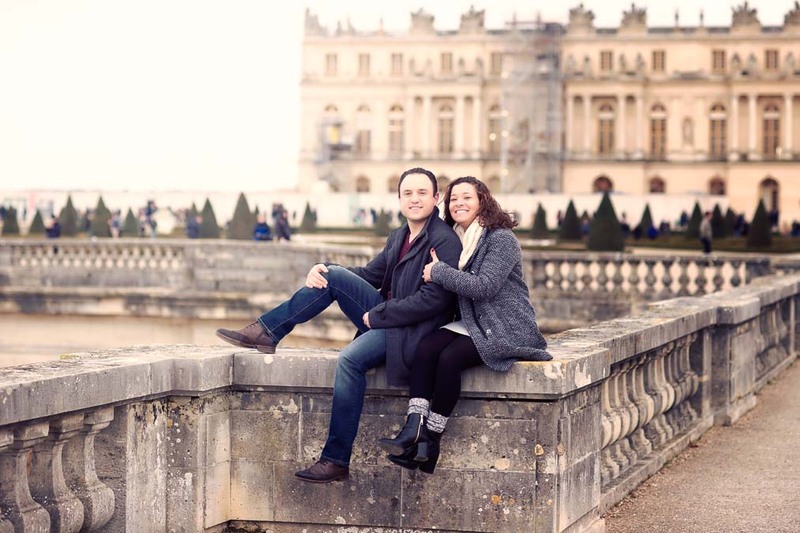 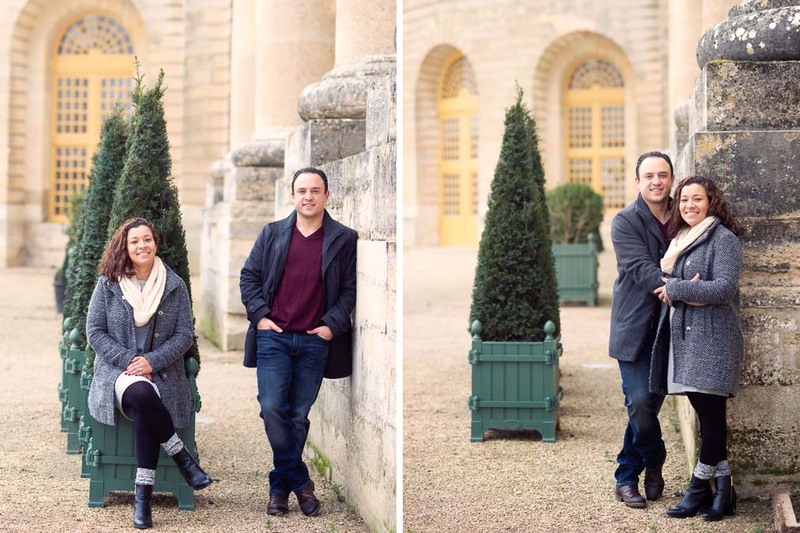 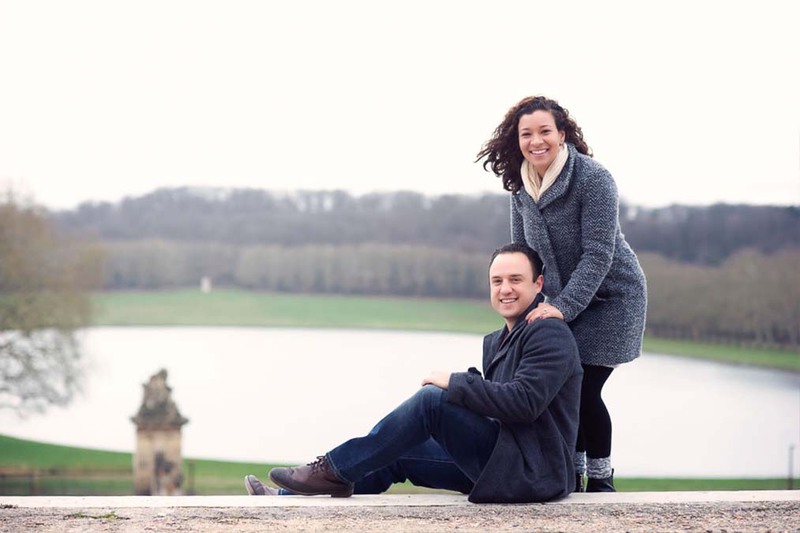 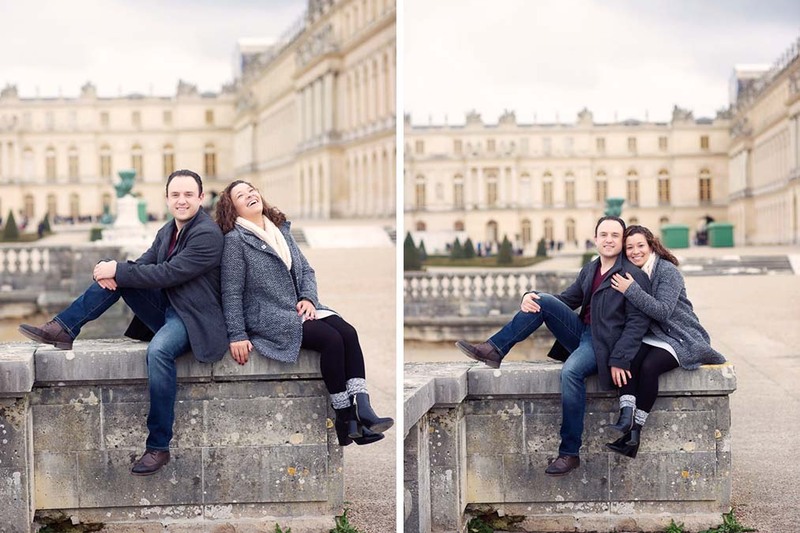 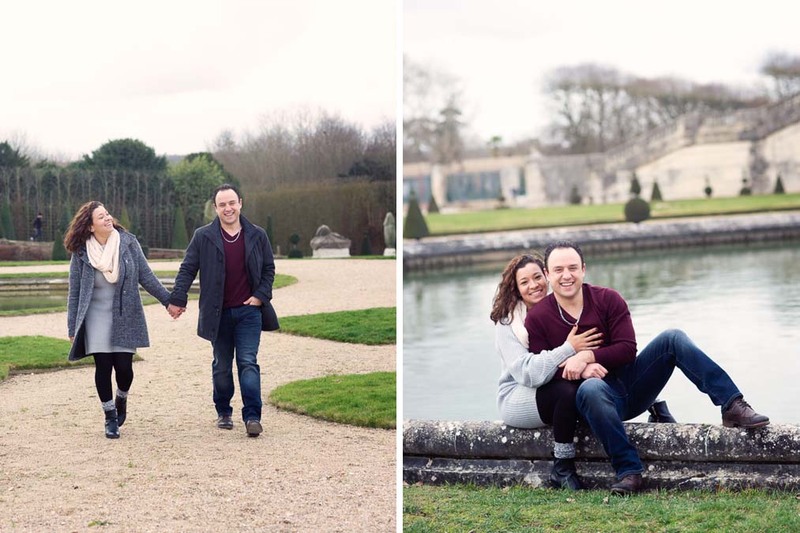 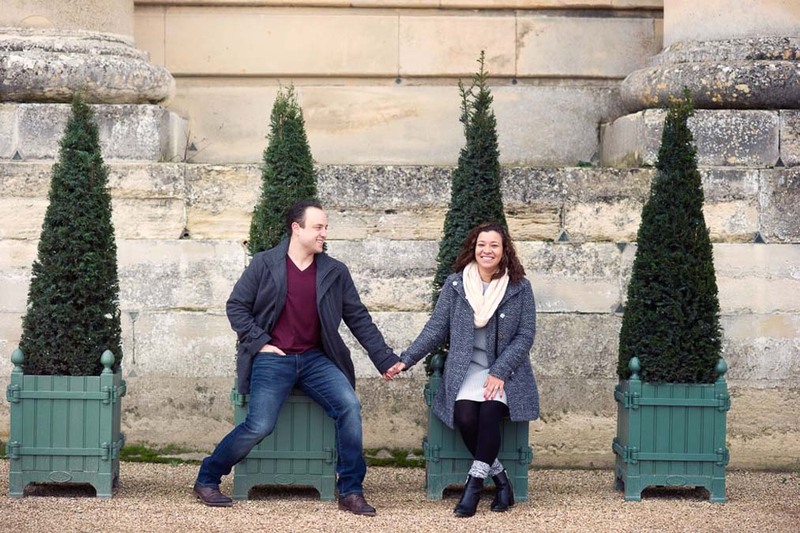 This time Olivier took our clients to the gardens of Versailles on a december morning for their pre wedding photo session. 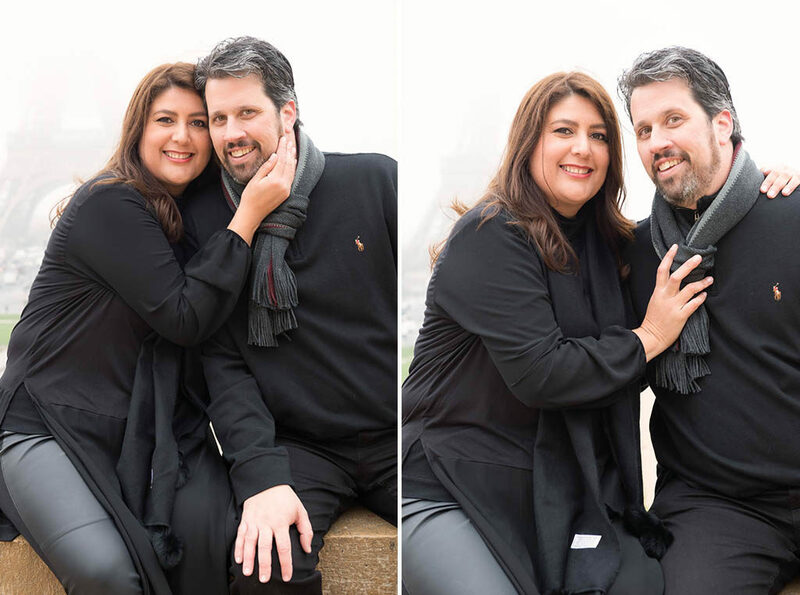 I think they had a blast. 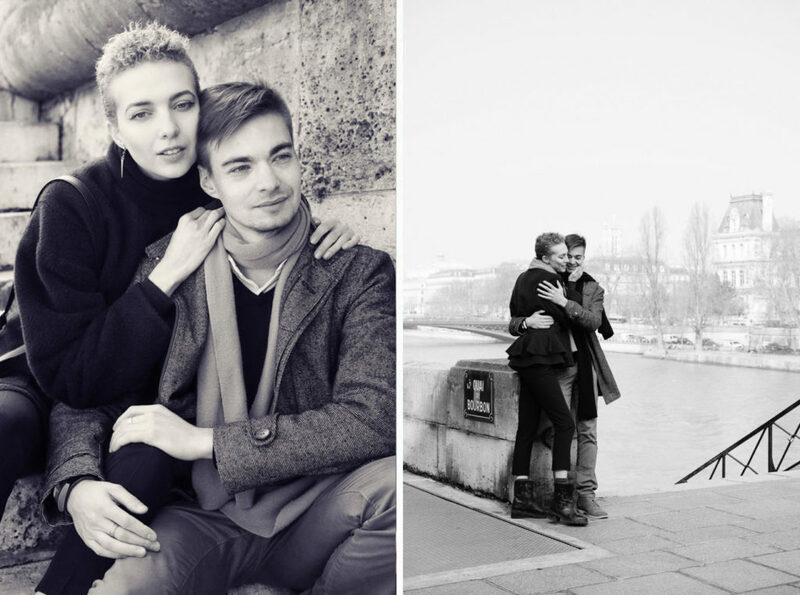 They look so happy and in love with each other. 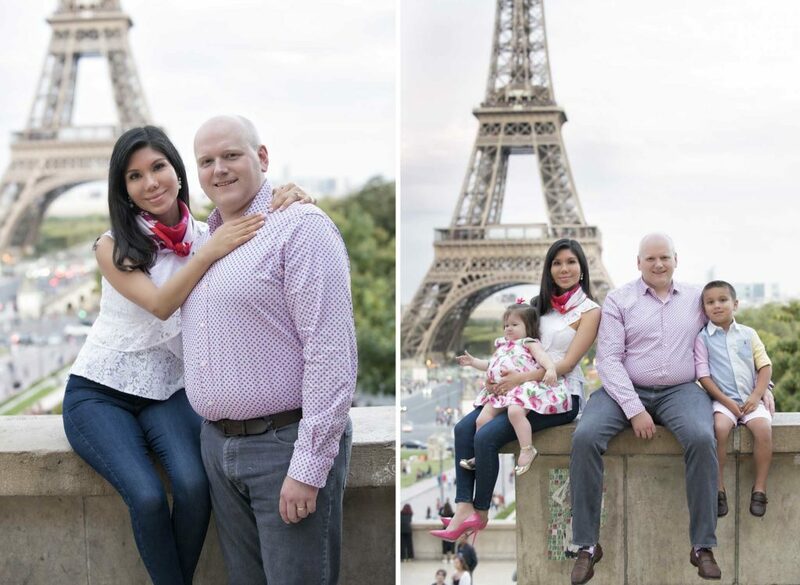 Big smile on their faces! 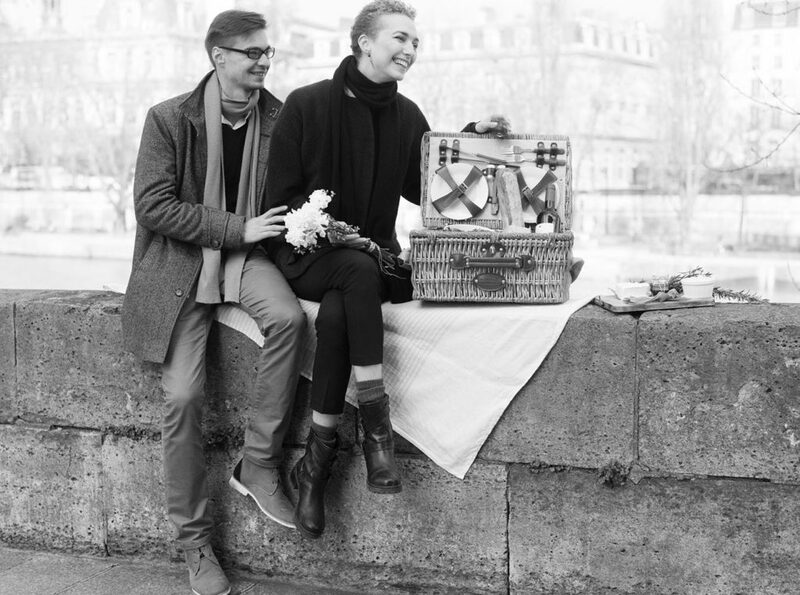 It is lovely to be able to help clients visiting the city either for a gourmet picnic of a creative photo session. 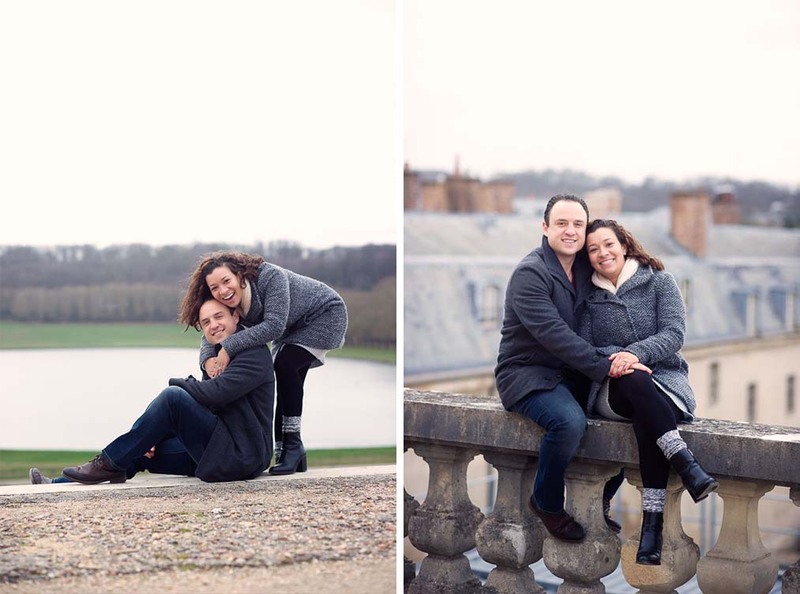 I think that Olivier did a wonderful job and it is a real delight to post a few of the pre wedding photo session of Brittany and Bill. 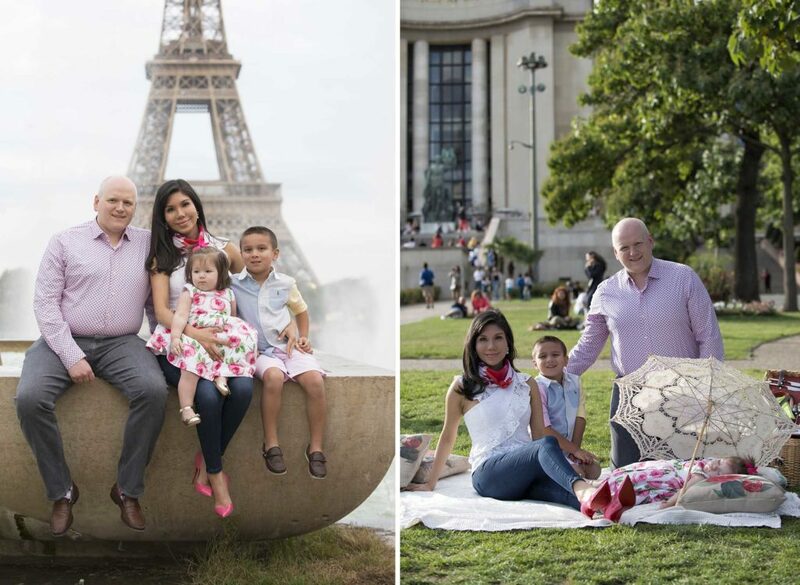 Enjoy all and if you are curious about one of our gourmet picnic or a photo session please do not hesitate to reach out. 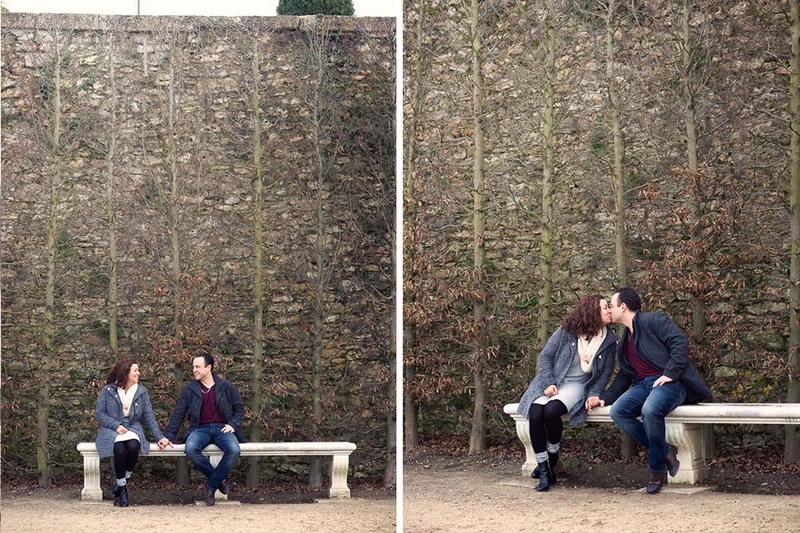 We do take booking for the following season already! 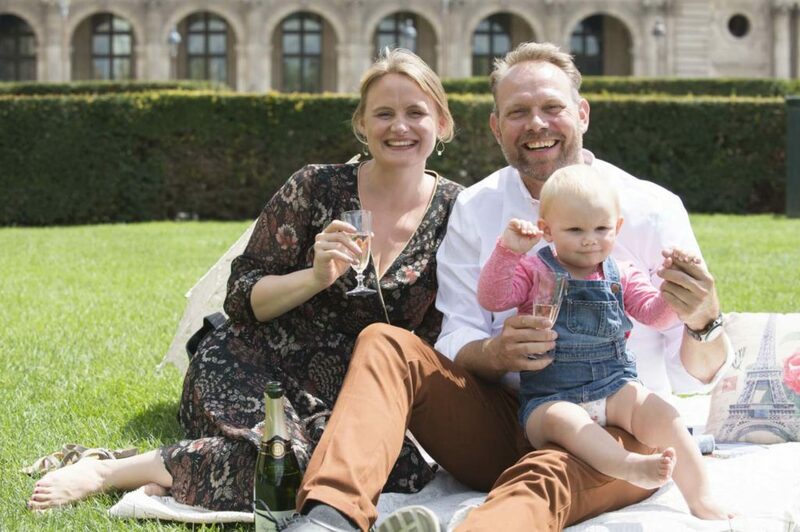 Cheers and happy New Year to all of you. 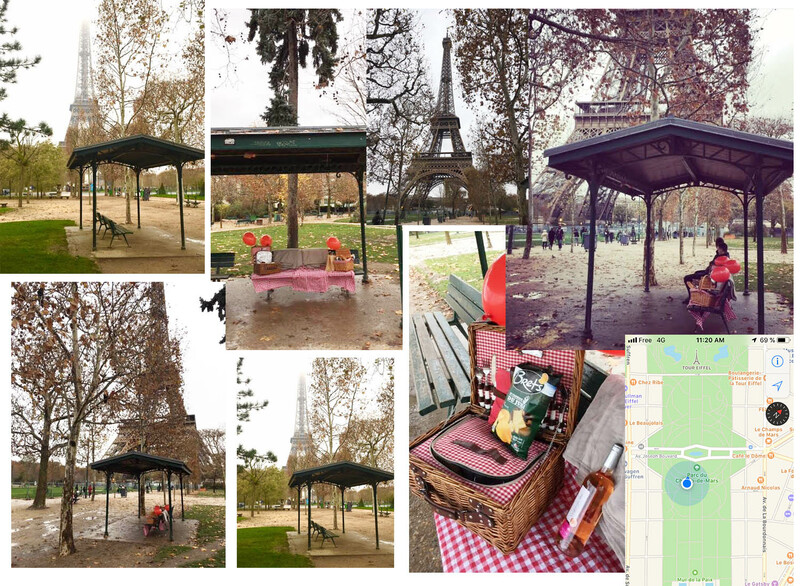 We set up our first winter picnic for a family visiting the city from San Diego this past week. 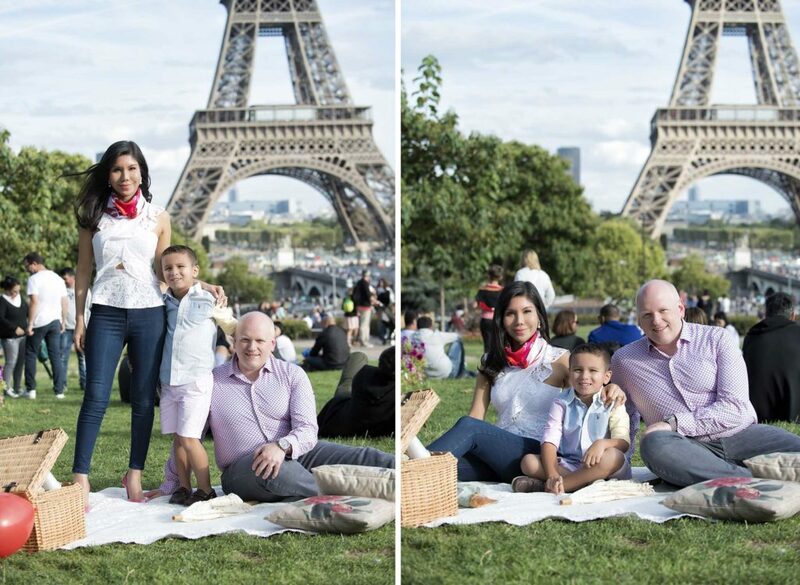 It rained on the day so we decided to have the picnic at one of the sheltered bench a few steps away from the Eiffel tower. This way they could enjoy our gourmet picnic “winter style” with hot coffee & tea and vegetable soup to start with. 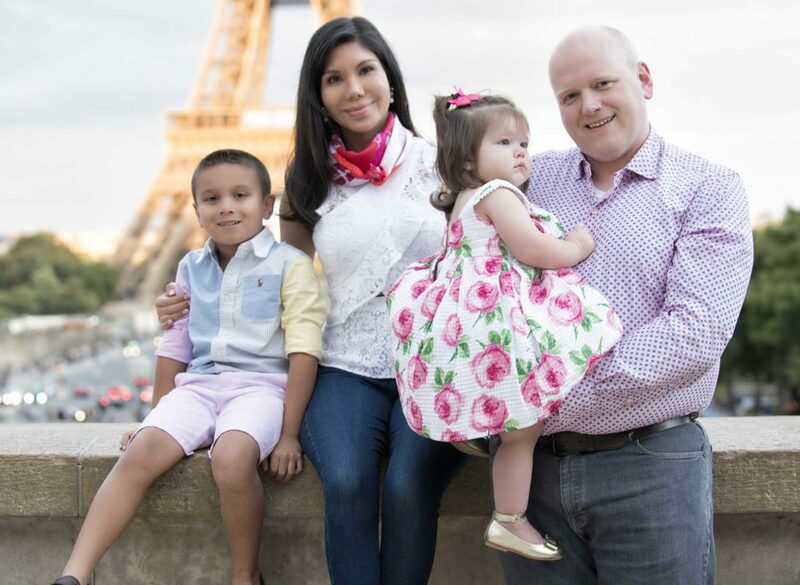 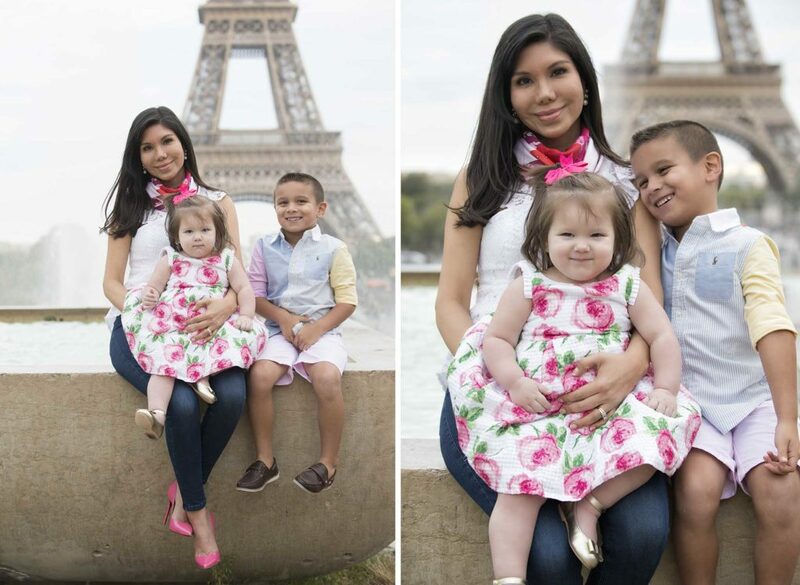 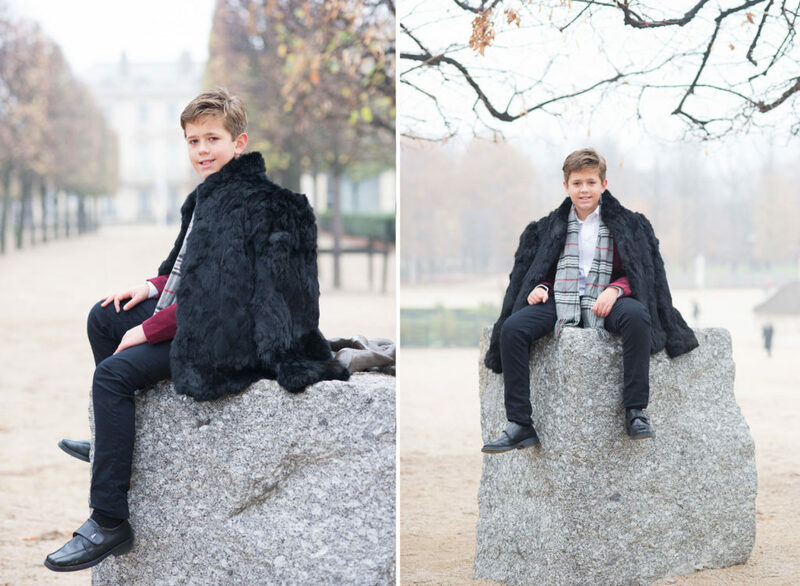 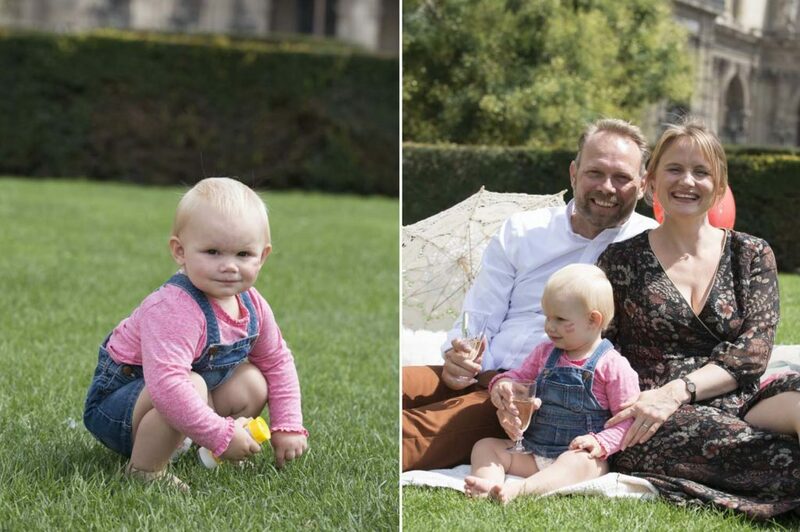 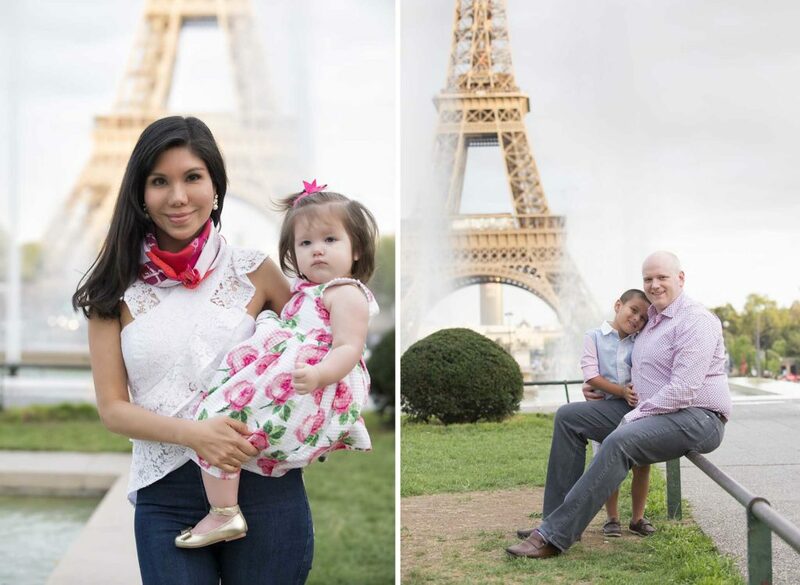 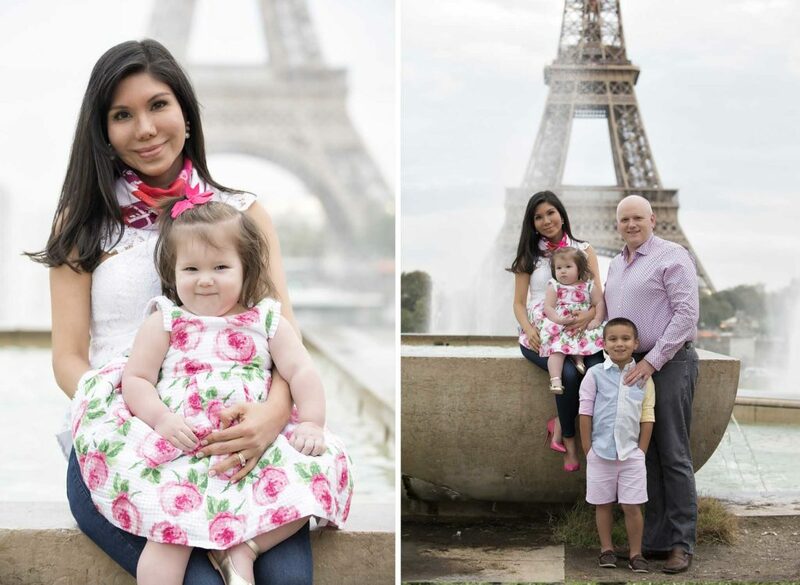 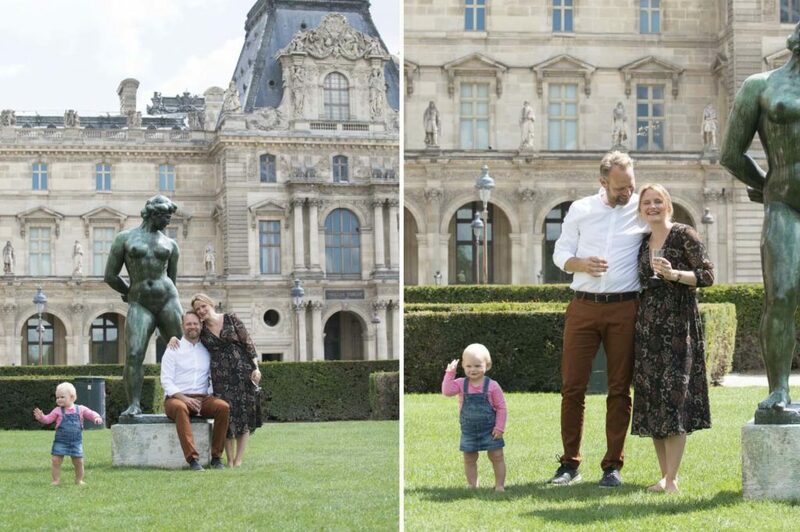 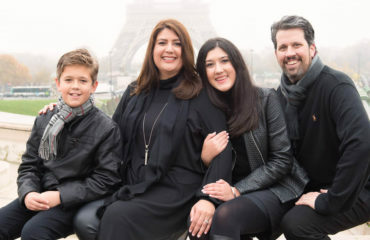 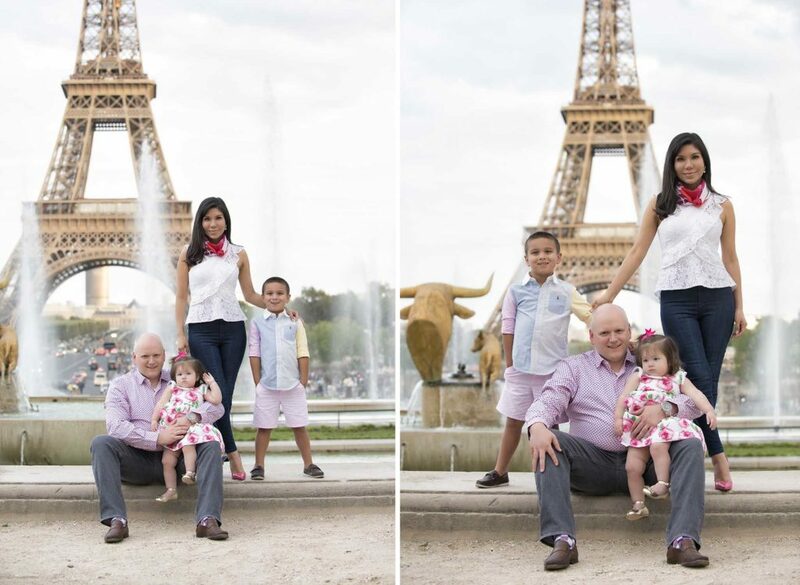 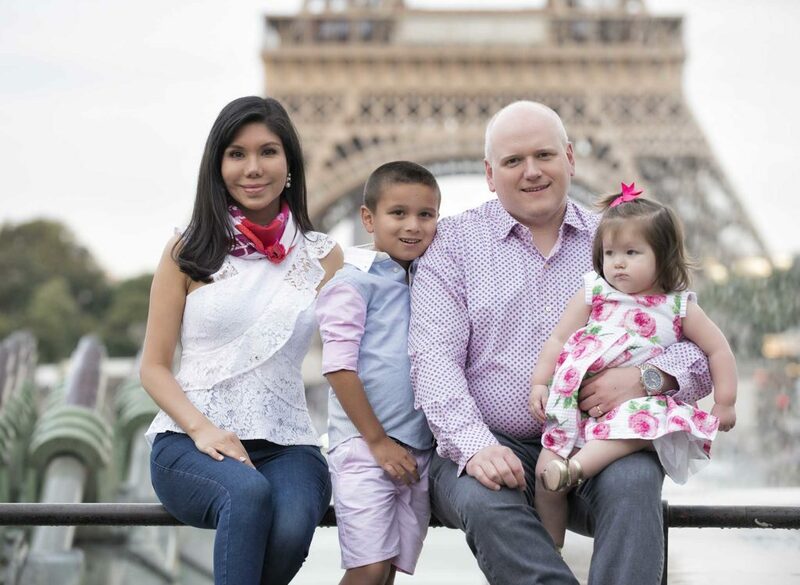 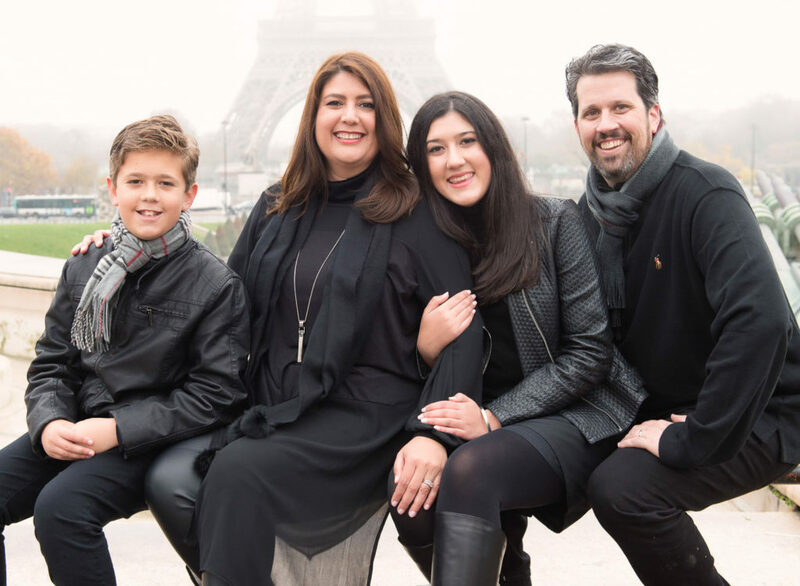 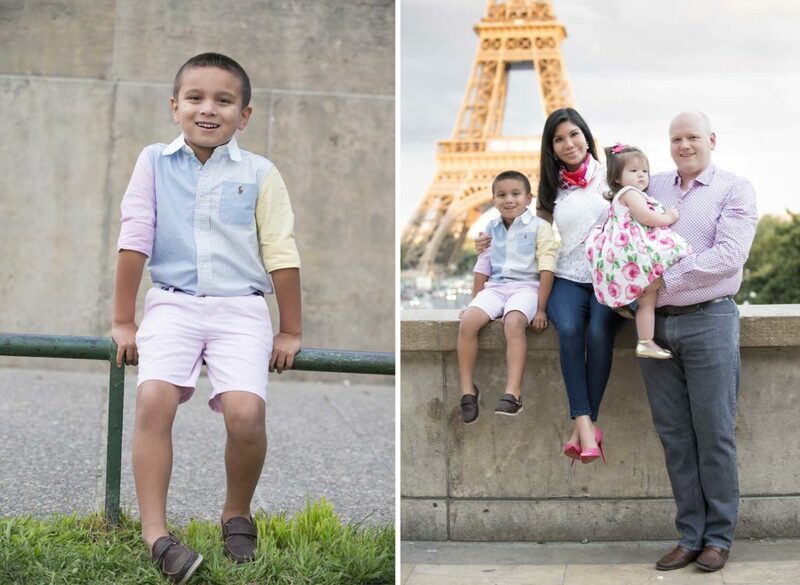 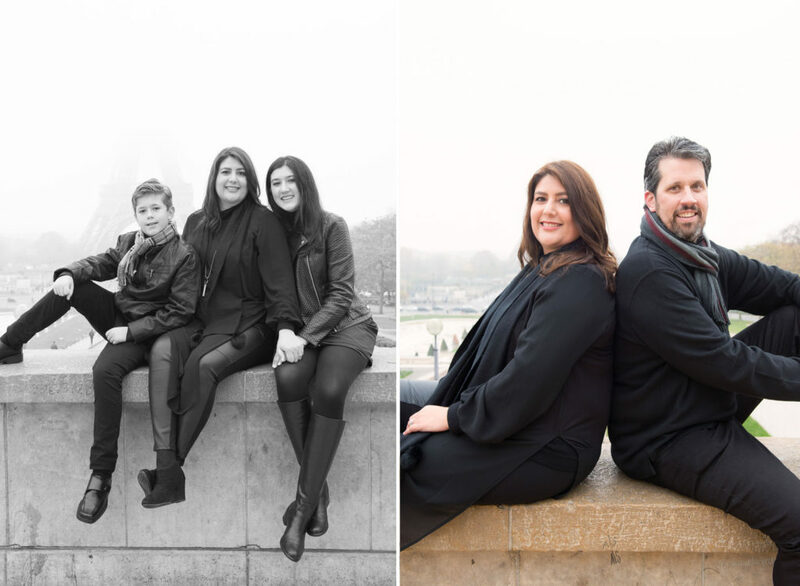 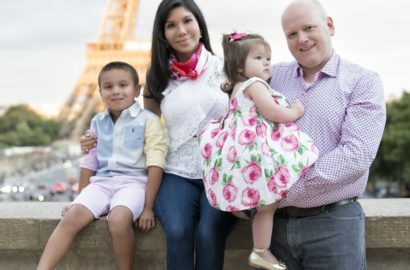 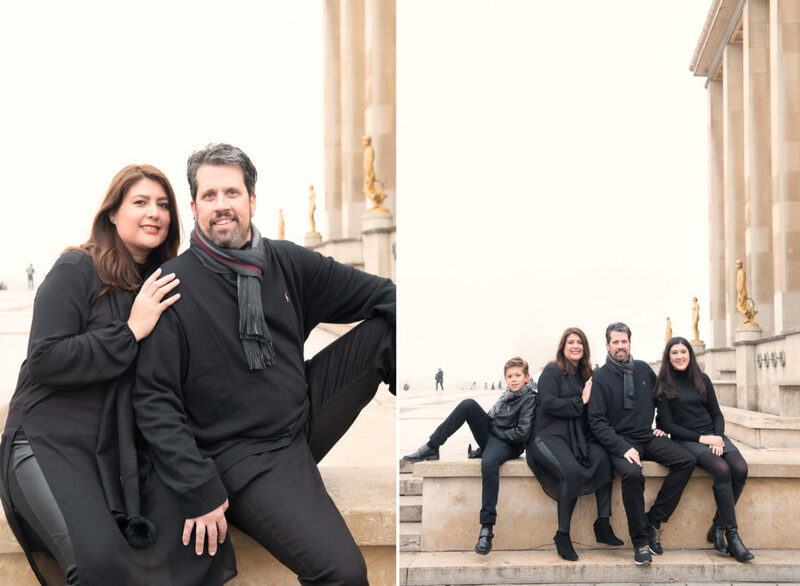 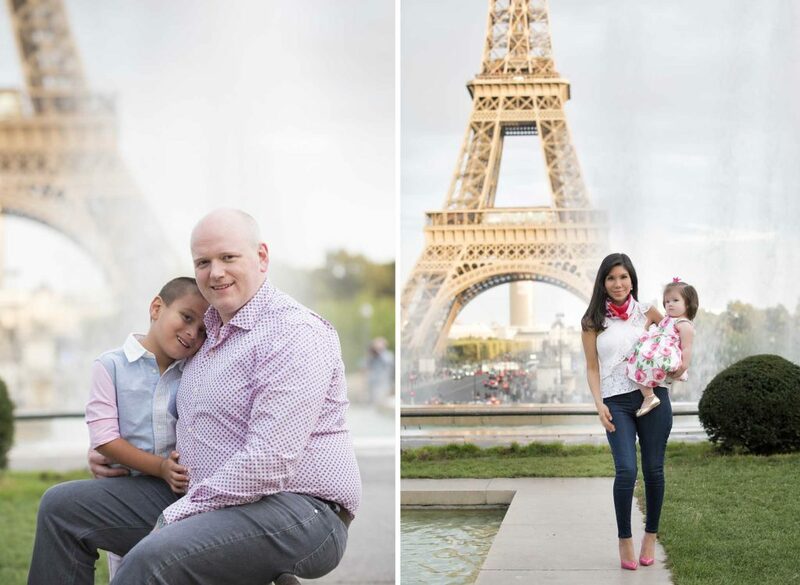 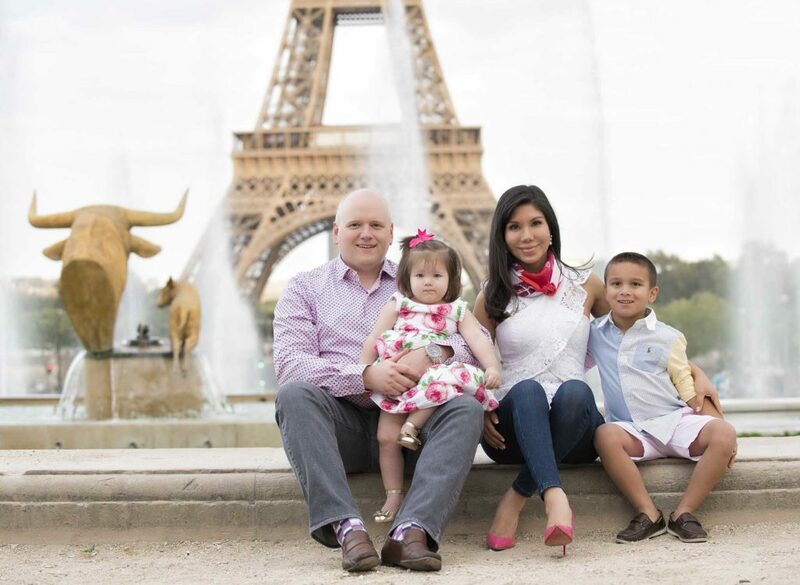 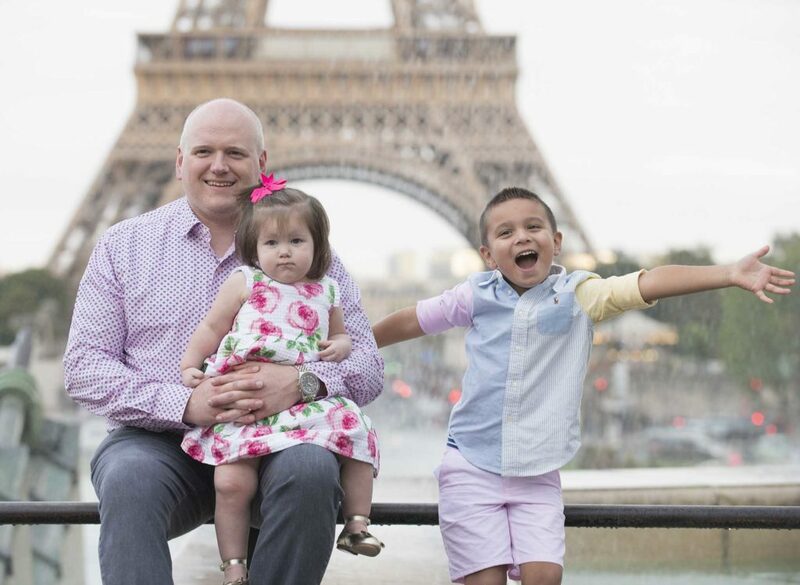 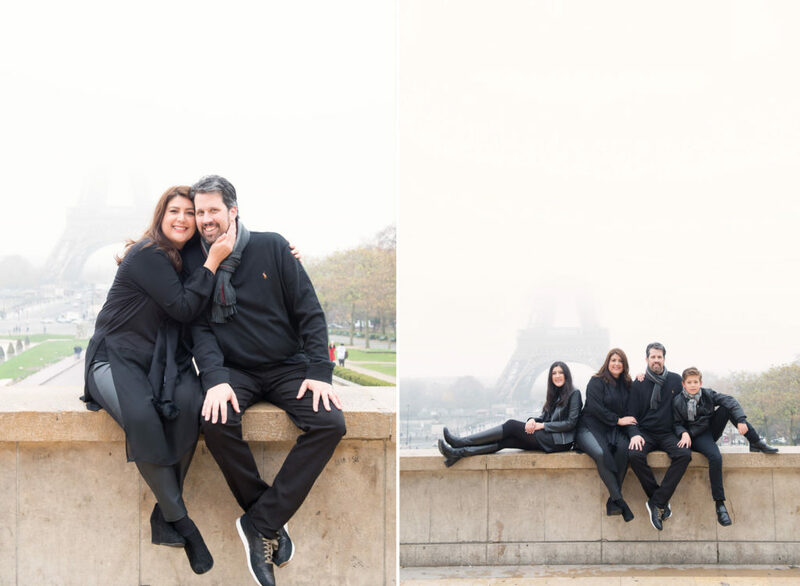 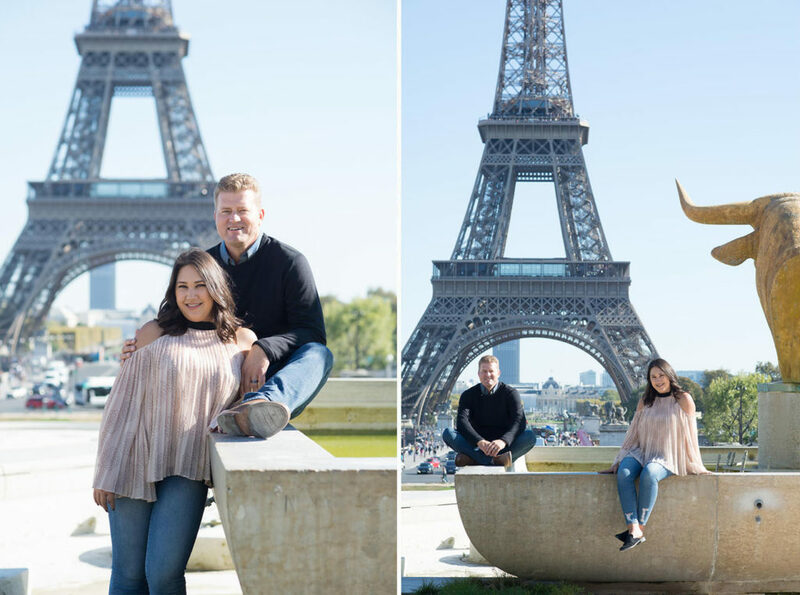 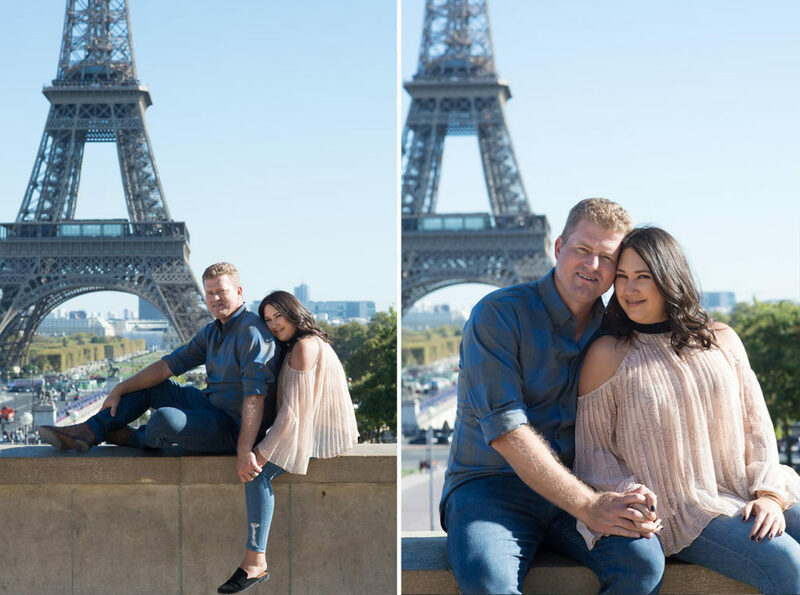 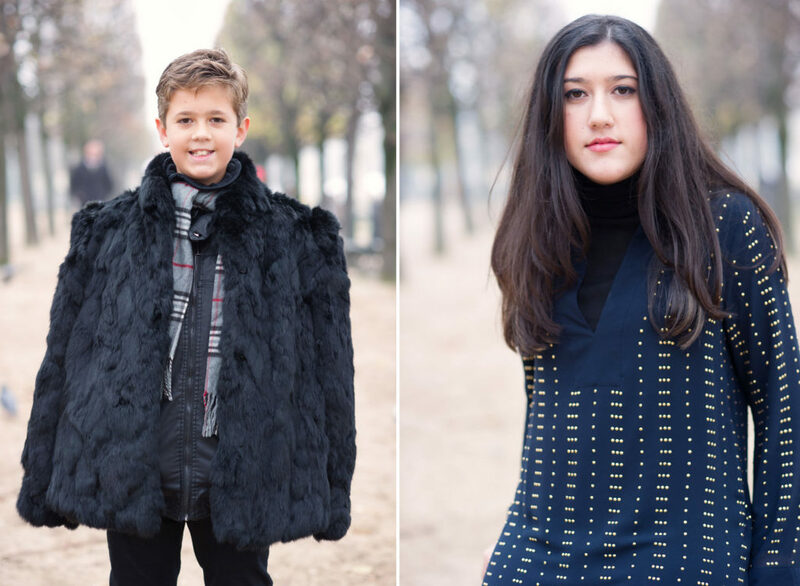 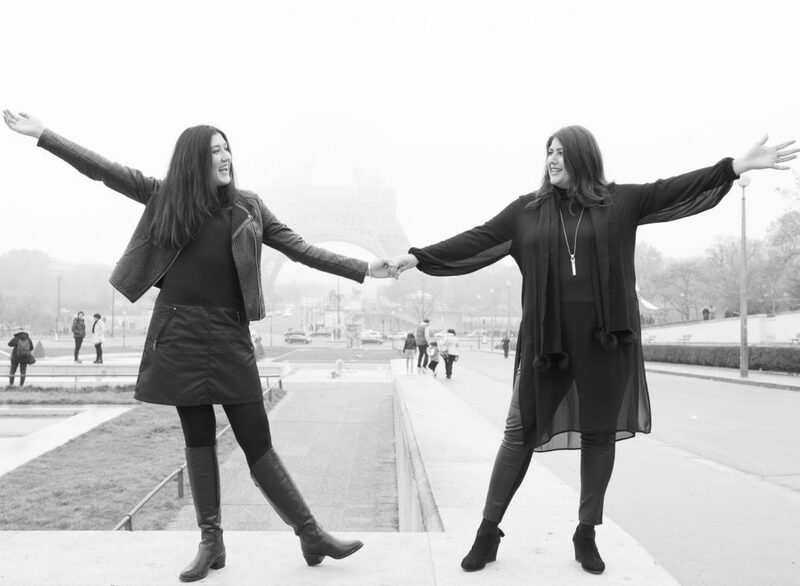 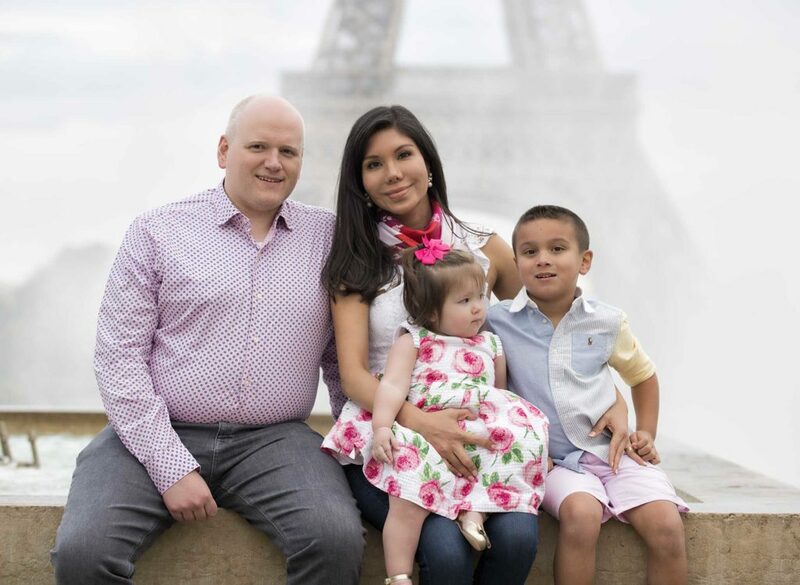 Our family had a family photo session with Olivier in the morning, they then headed to the champ de Mars for their lunch before visiting the Eiffel tower in the afternoon. They had purchased Eiffel tower tickets online so that they easily passed the ticket office and the eternal queue of tourist, to reach the elevator which took them all the way to the third floor. 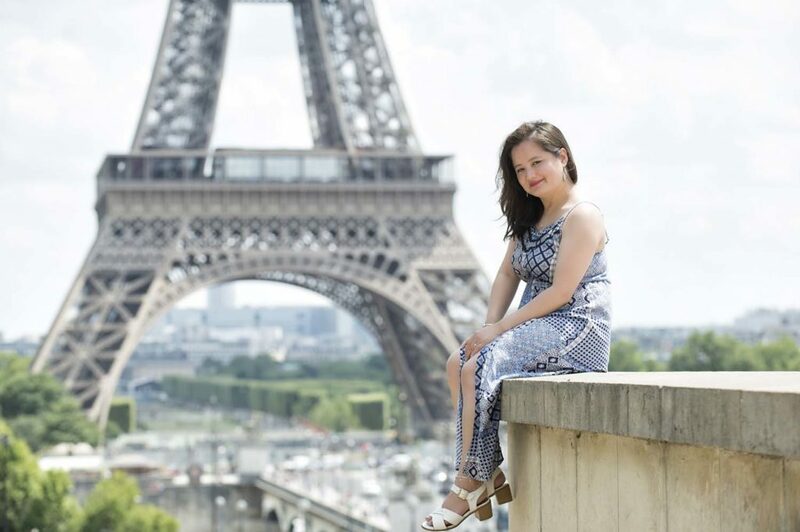 It is an incredible experience to climb the tower all the way up and enjoy the incredible view over the city from up there. 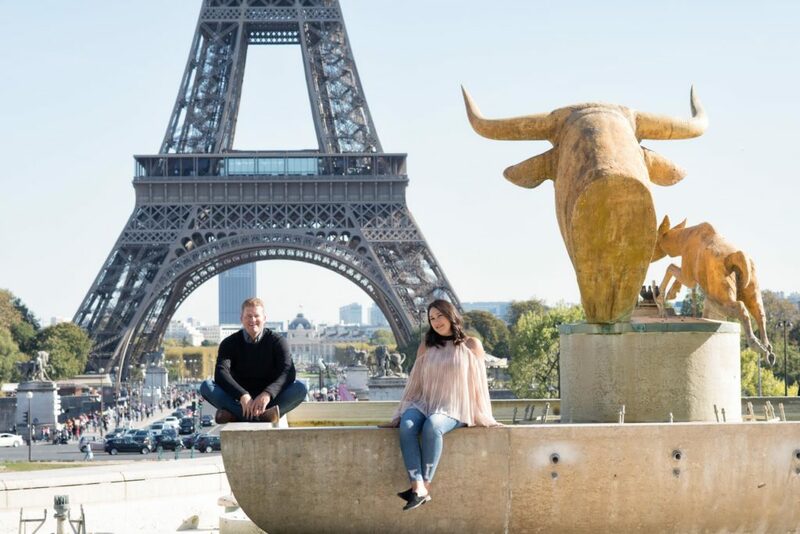 I was 8 year old when my parents took us there for the first time and i still vividly remember the experience; mainly my dad being sea sick! 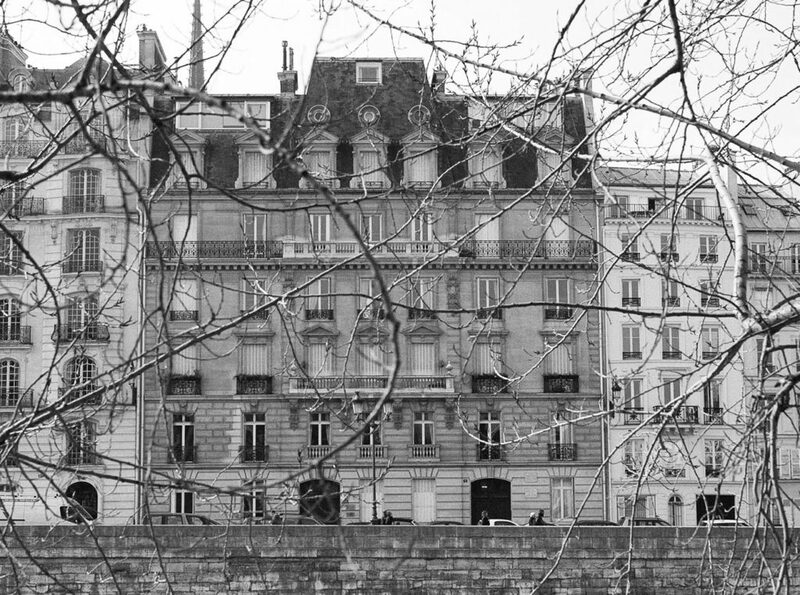 i remember this gigantesque view, the conquered tower, the grand adventure, running down the steps ahead of our parents, resting on each floor to the ground level again! 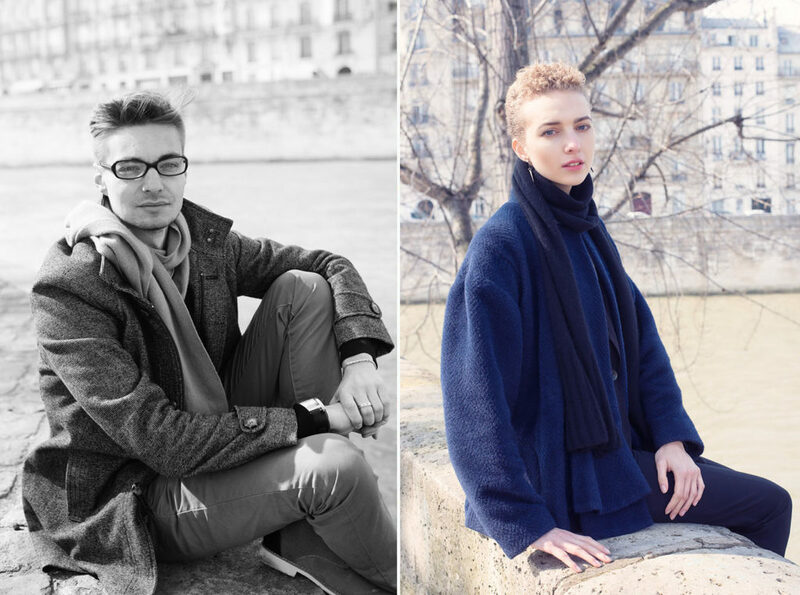 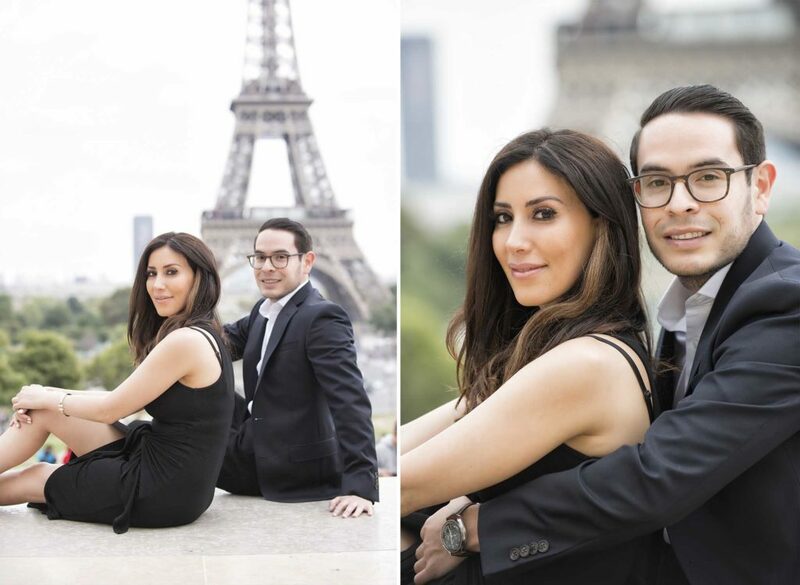 Connect to his instagram @weddinglight or his website to view some delightful Parisian style photo session. 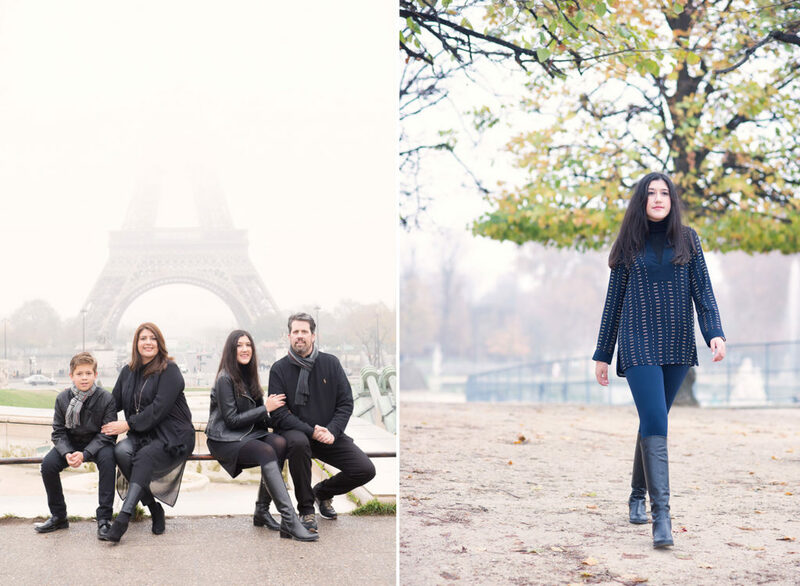 If you are in need of a creative photographer while visiting the city, either for family portraits, an engagement session, a secret proposal, or simply creative visuals for your social media, get in touch with Olivier ; he simply ROCKS! 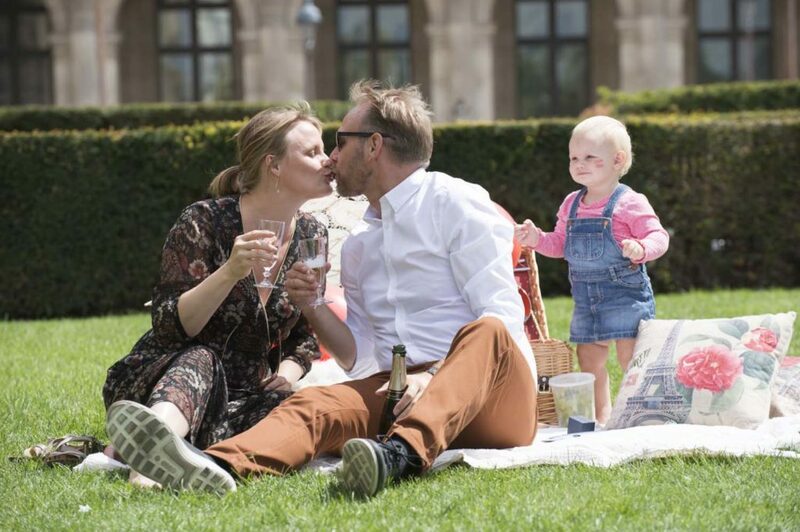 A few more words regarding our winter picnic now ready to order! 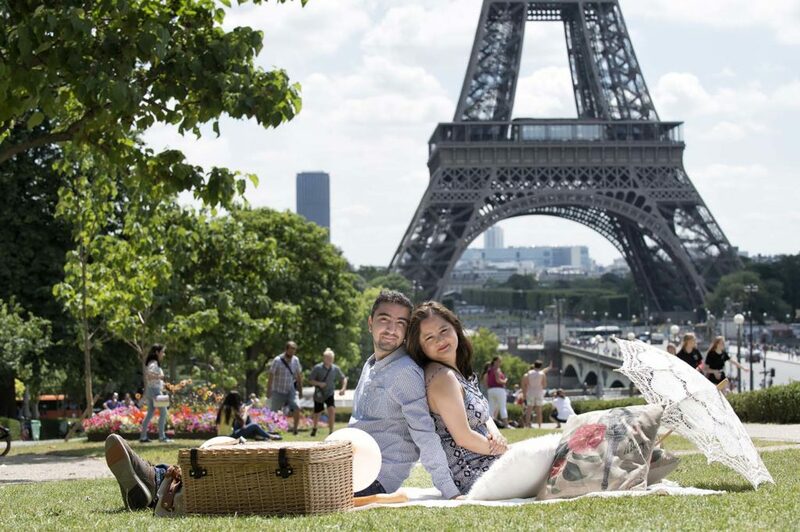 If you are intending to visit the Eiffel tower, it is a great way to have lunch just before or after your visit. 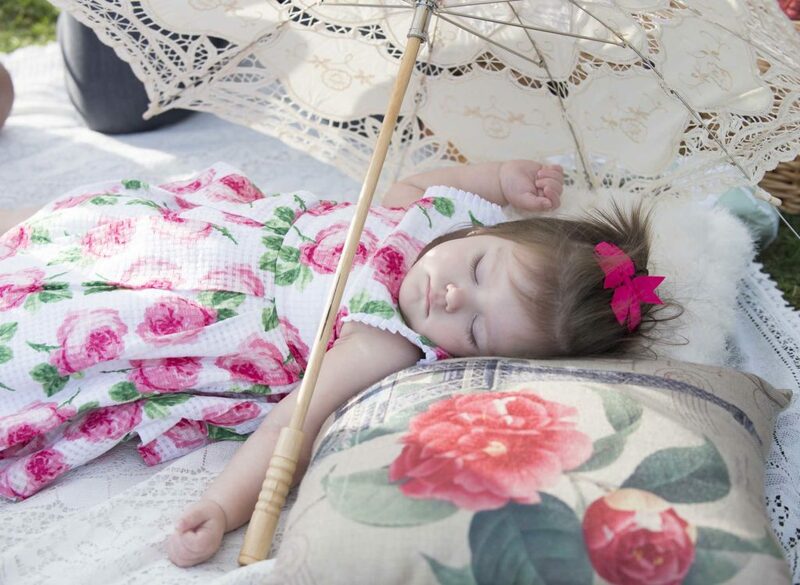 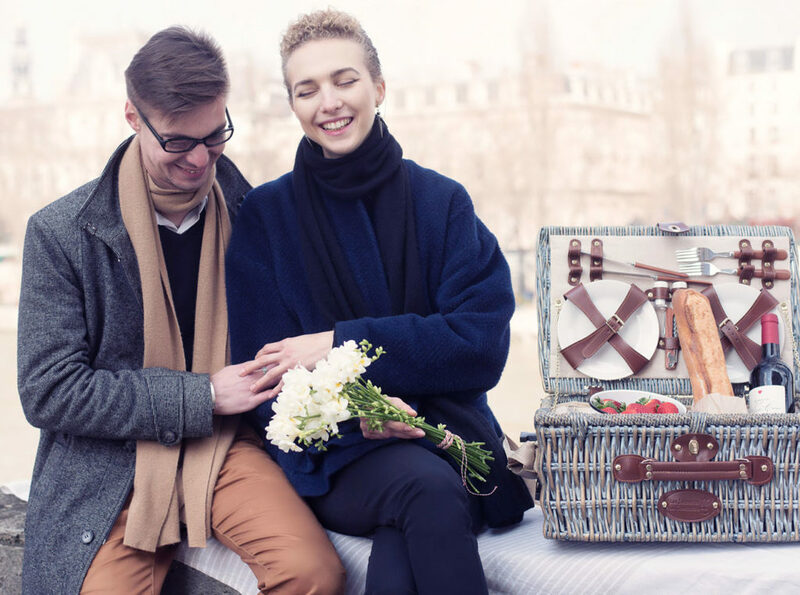 We would set up your picnic for you with balloons and blankets so that you do not have to worry about the logistic ( picking up or returning the wicker baskets ). 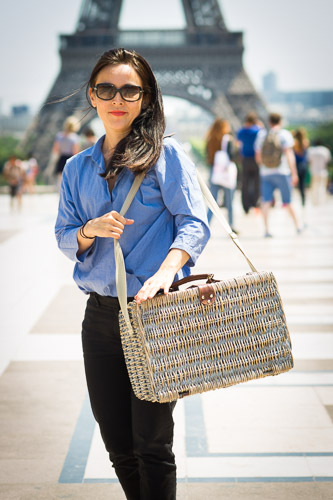 The picnic location would be on the champ de Mars and easily accessible from the tower. 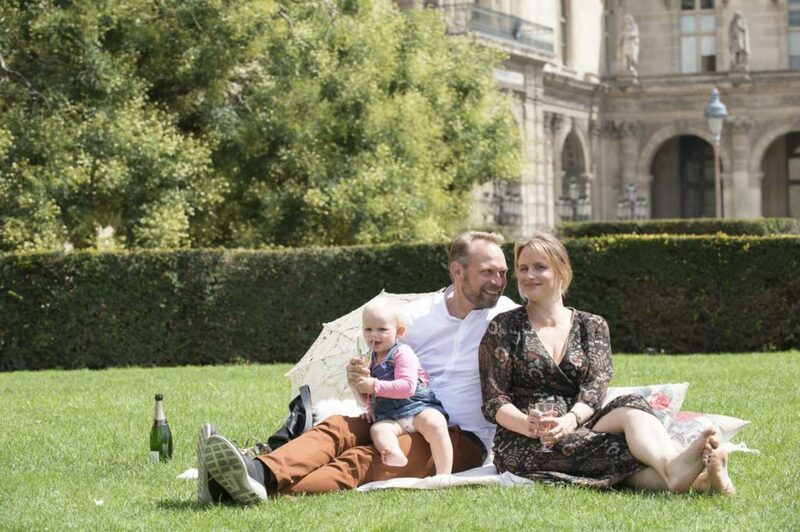 We could alternatively set up our picnics at the Luxembourg gardens if weather allows. 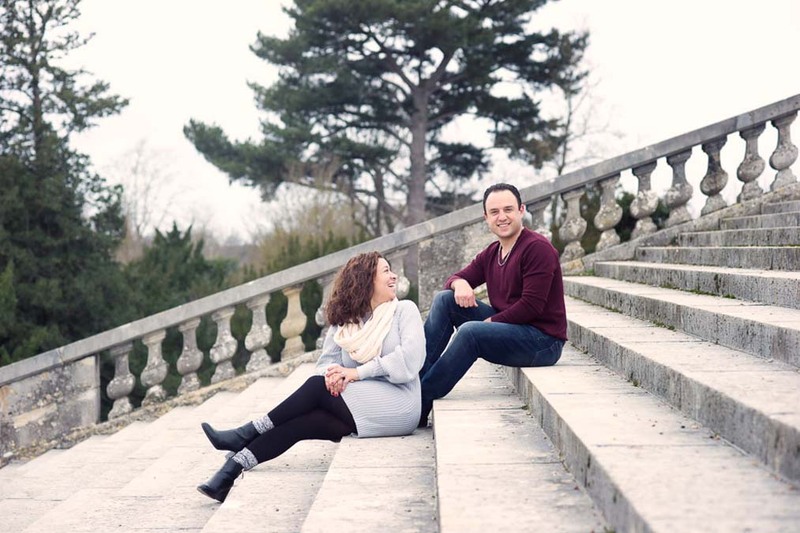 We would point you to the set up with geo localization and whatsapp in the morning of! 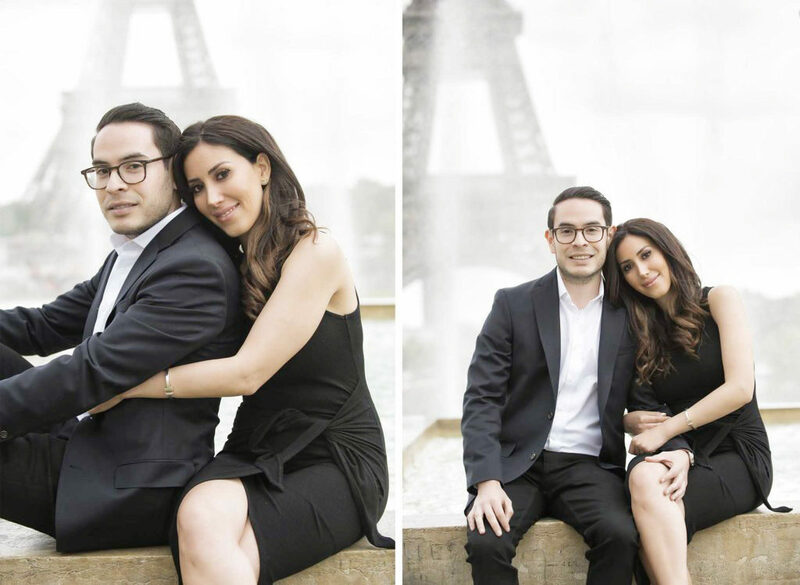 We do love ( from time to time ) those new technology which made your life easier! 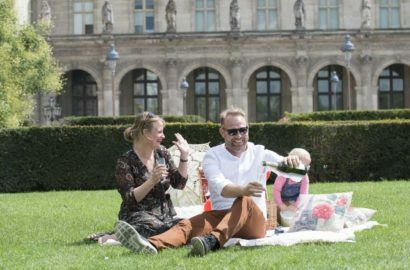 Our winter picnic comes with a bottle of wine ( champagne optional ). 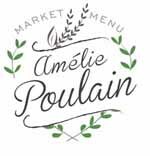 It is served with tea and / or coffee, a hot vegetable soup, a market quiche, cheeses and selection of cured meat, fresh market salad and a dessert. 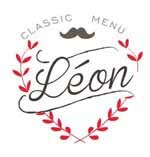 ( fruits or chocolate cake ). 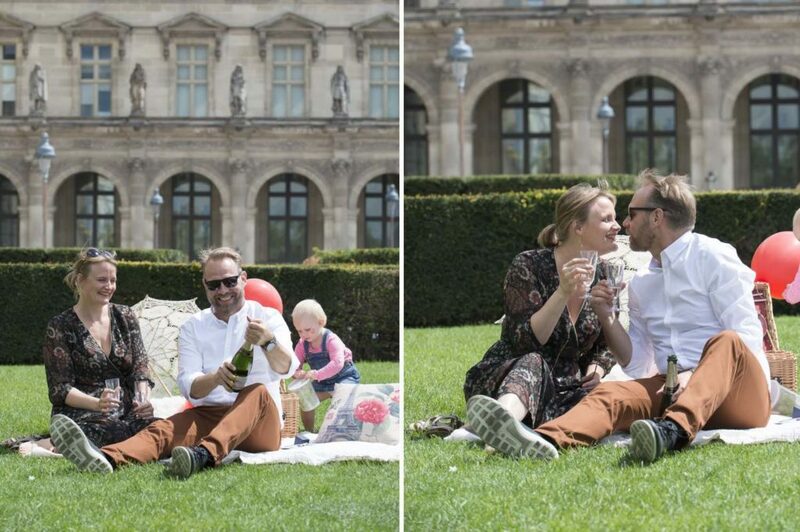 Our gourmet picnic can be coupled with a lifestyle photo session with Olivier either prior or after your lunch. 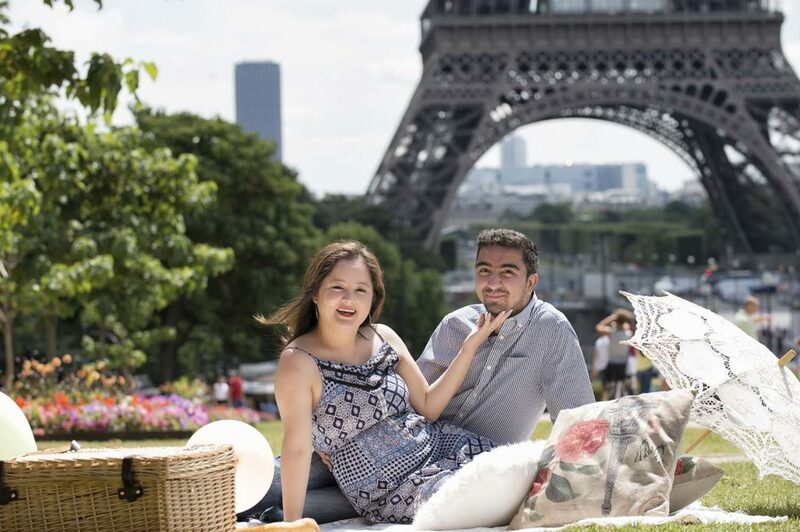 A gourmet picnic with “Love Picnic Paris” coupled with a photo session is the ultimate surprise for a secret proposal in the city with your loved one. If you are flying over with your girl friend and are interested in our gourmet picnic / Photo session package during the winter months, reach out to us via email, we would be delighted to organise the day for you! 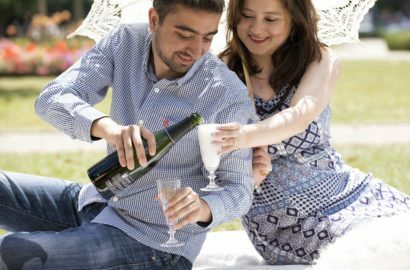 The price of our winter picnic is € 290 serving two, all inclusive, this is including the surprise set up. 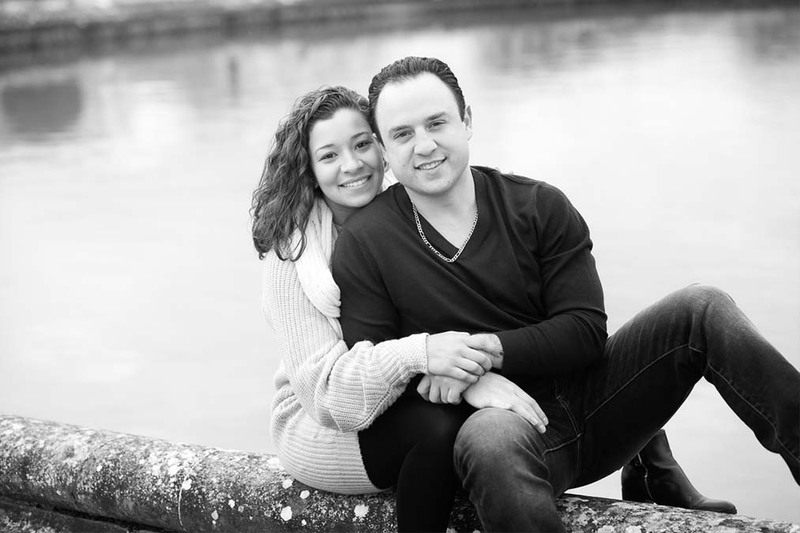 We are looking forward to many happy clients in the months to come. 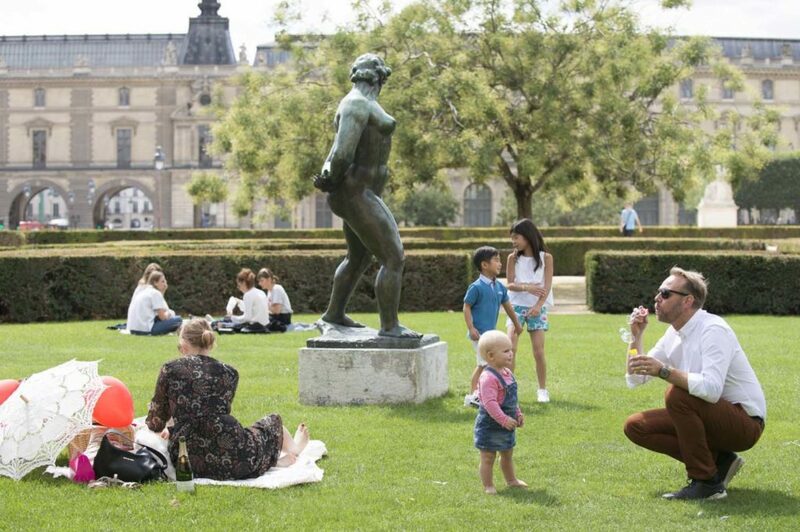 Summer time in Paris rocks! 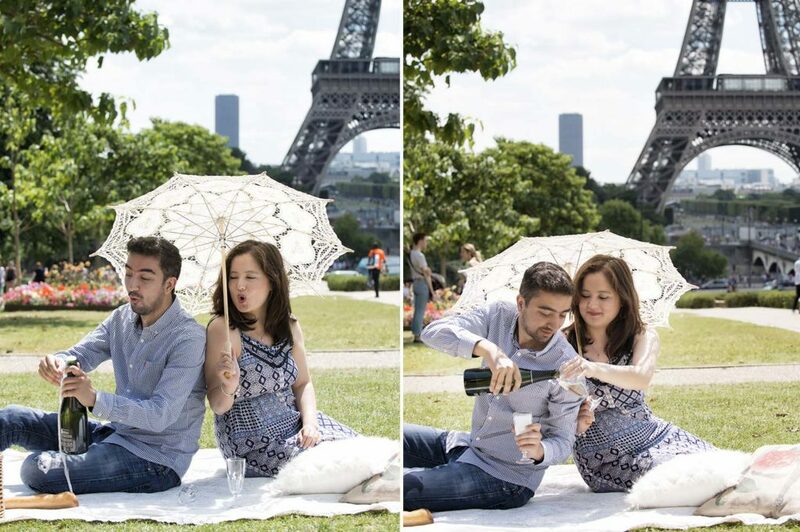 It is quite hot though, rule number one drinking LOTS of water and sipping on a glass of champagne here and there. 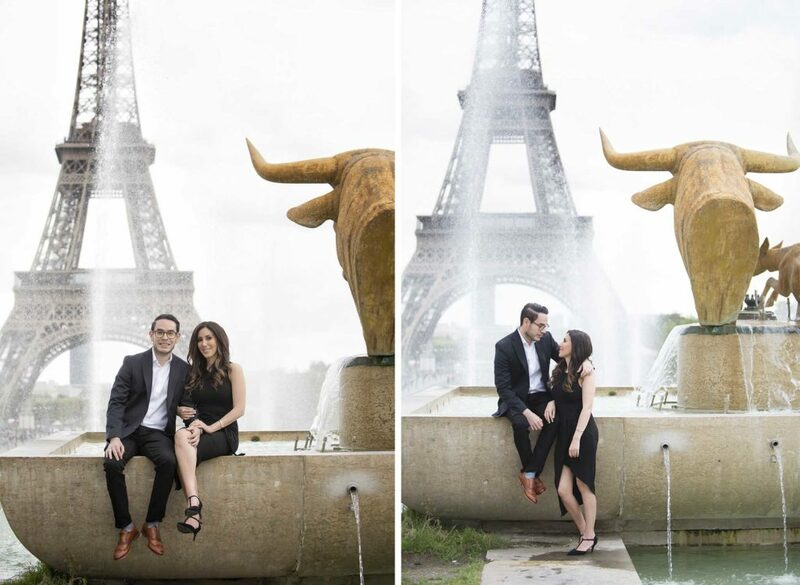 Sepehr took his girlfriend to Paris for a few days. 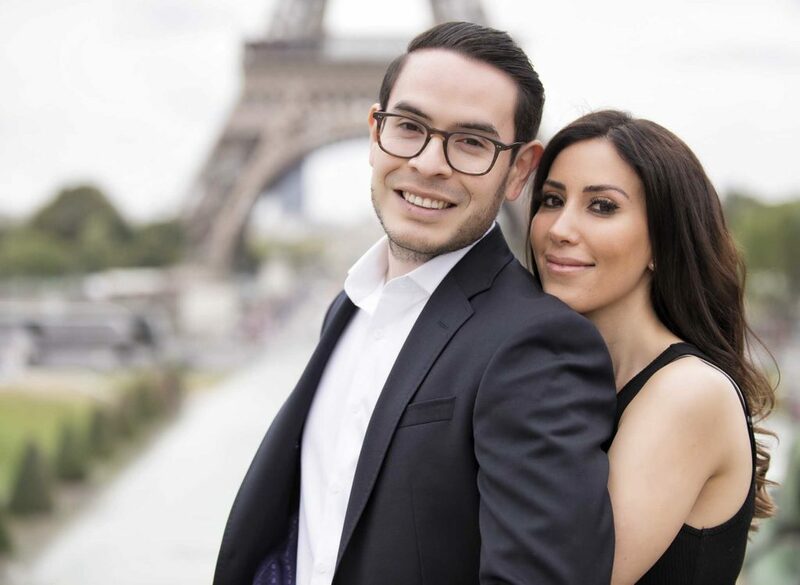 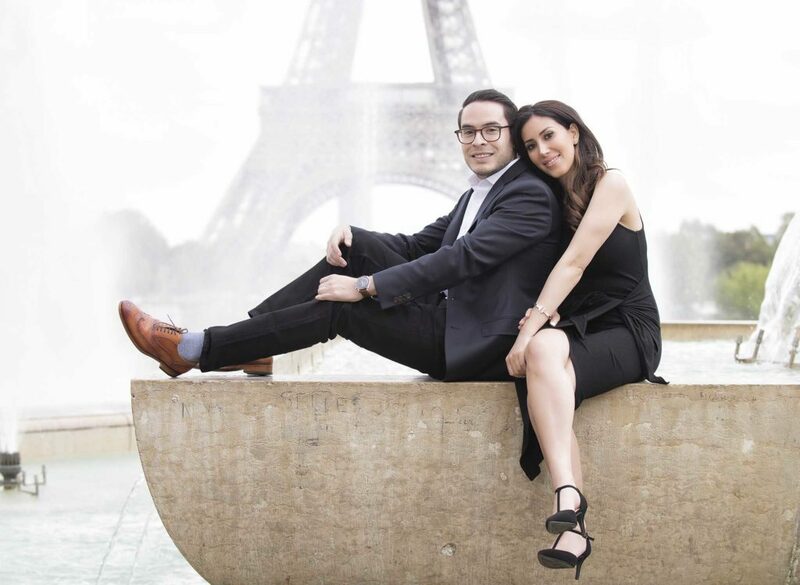 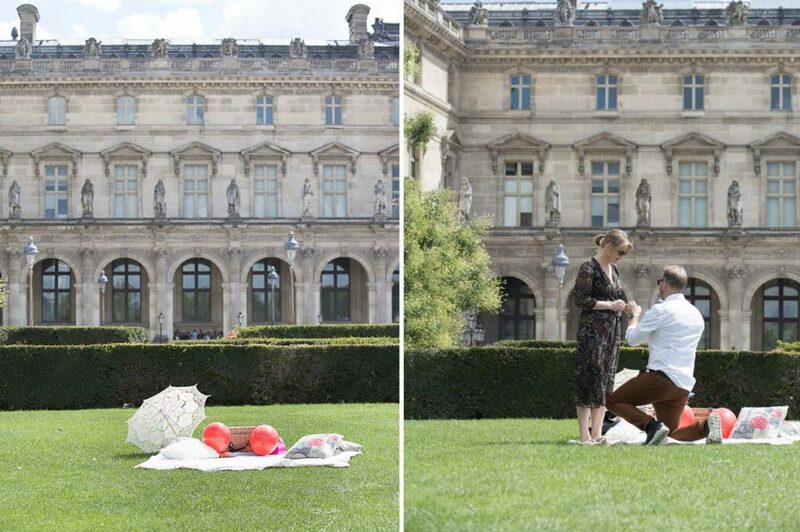 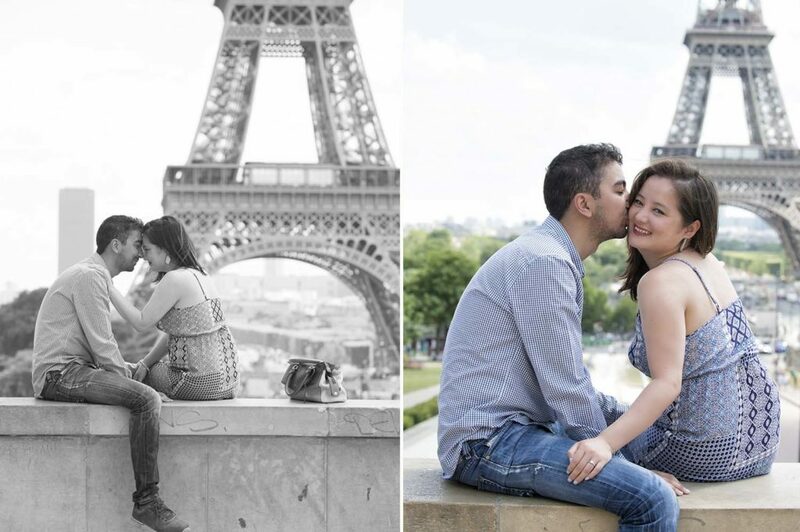 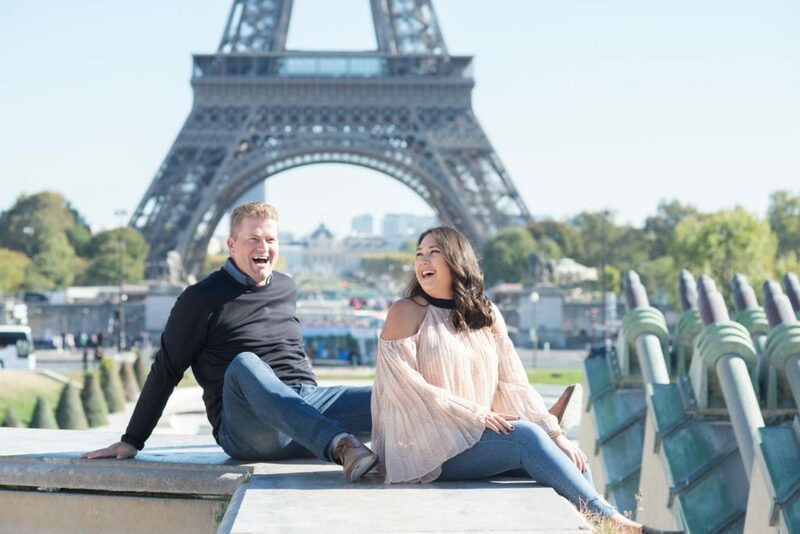 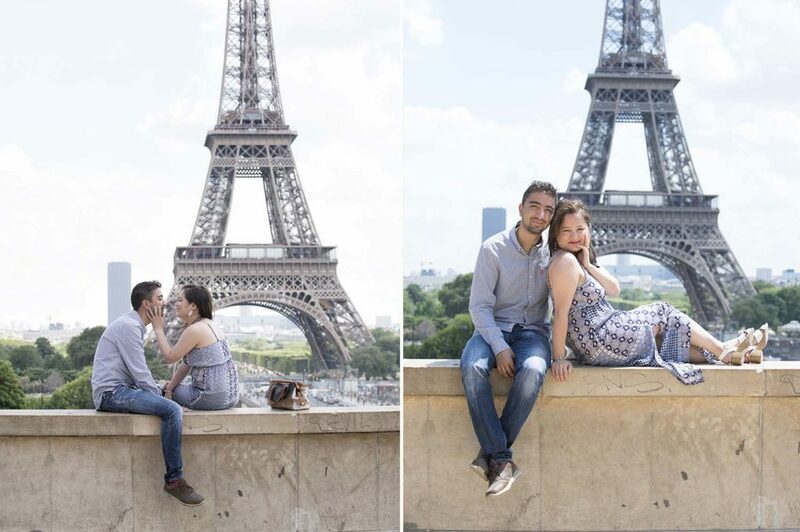 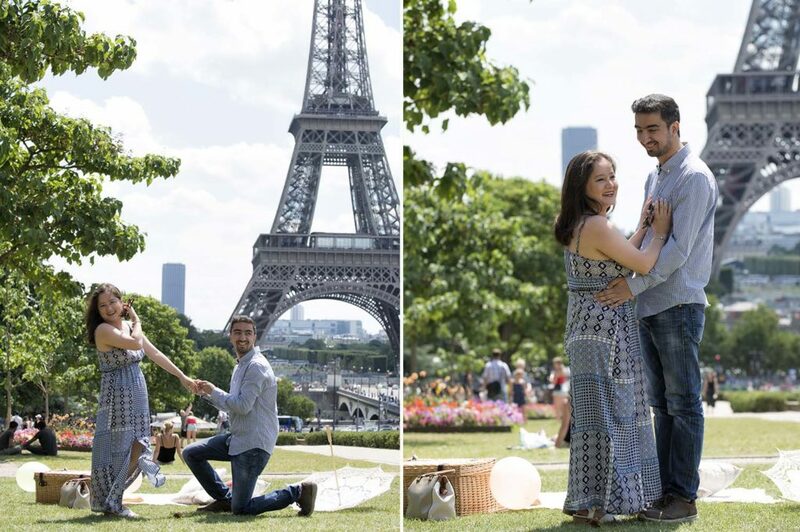 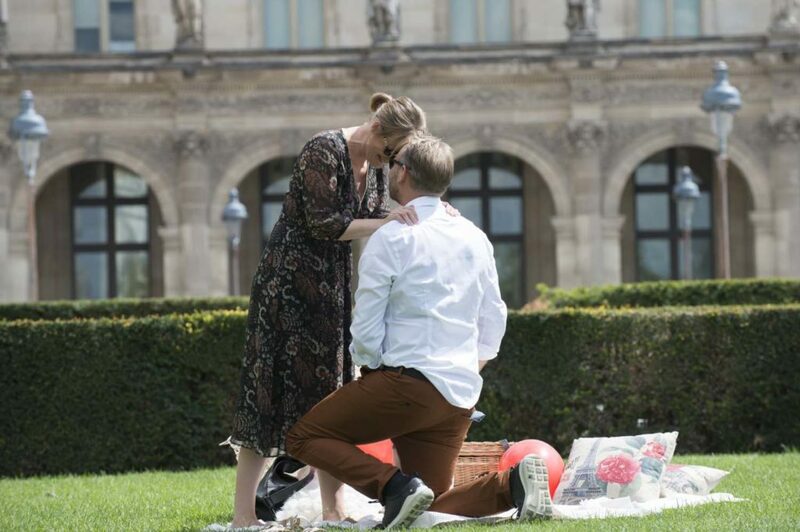 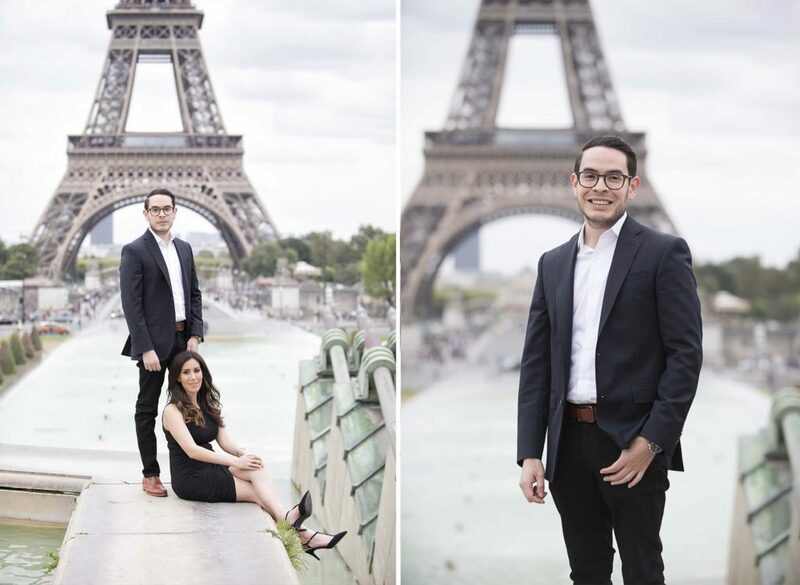 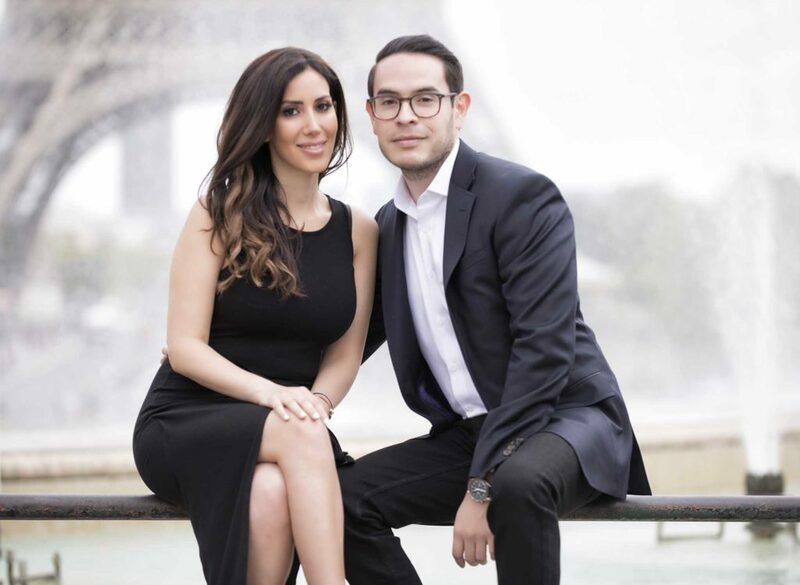 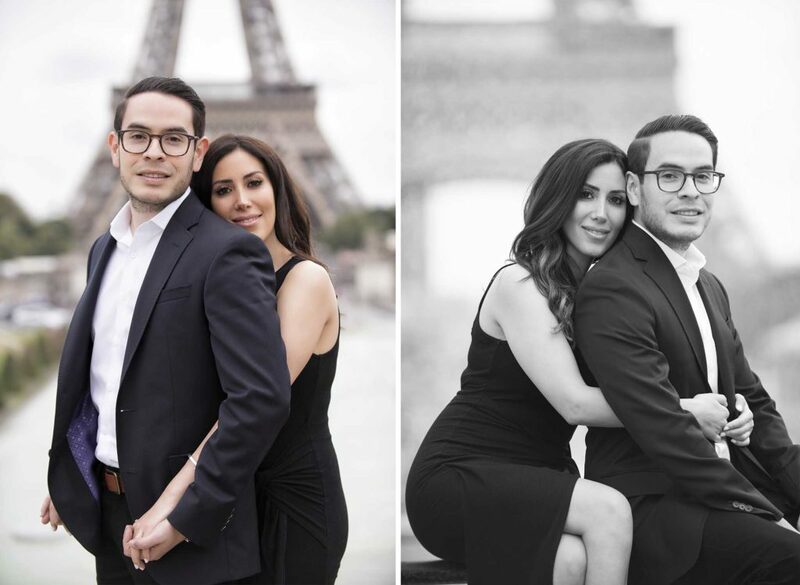 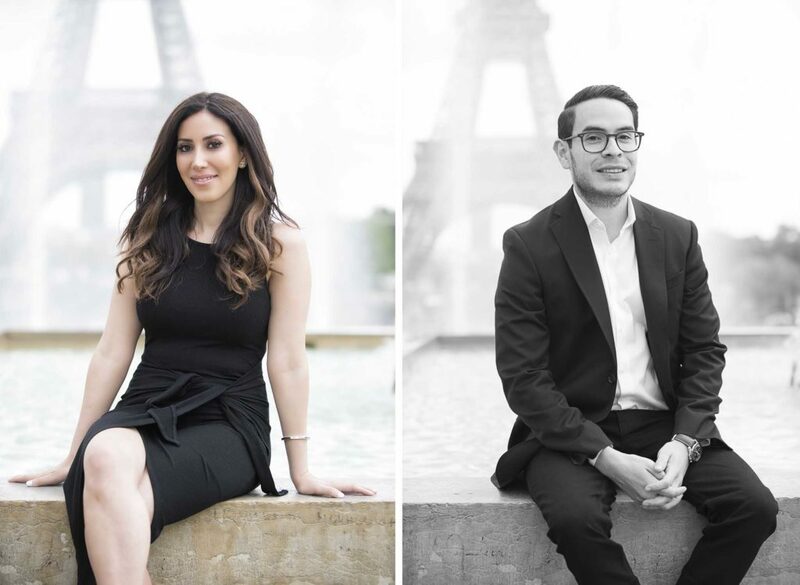 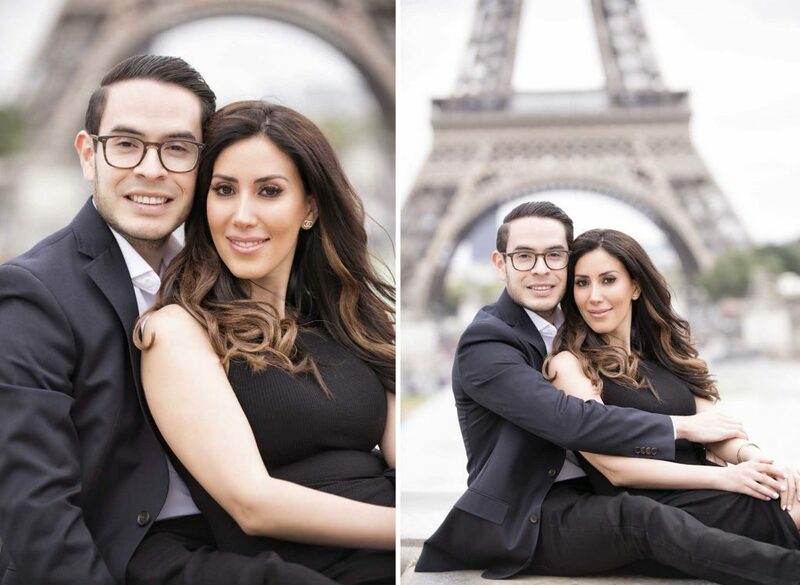 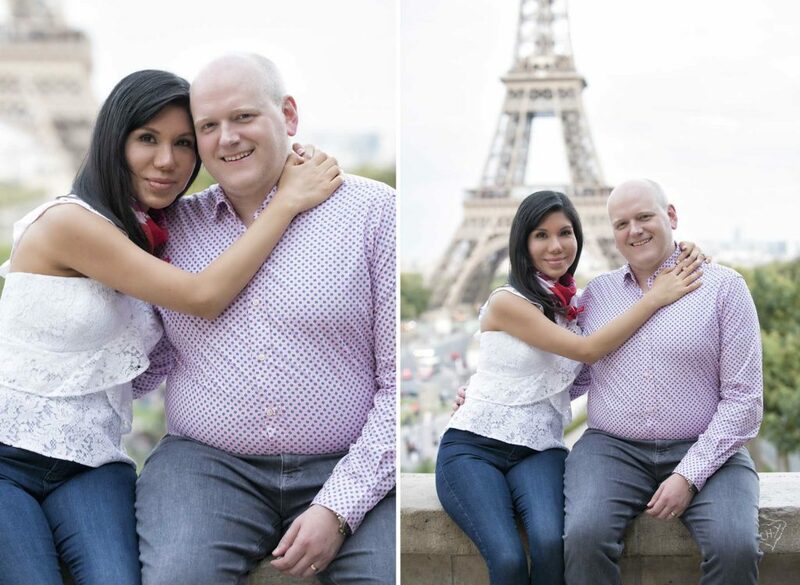 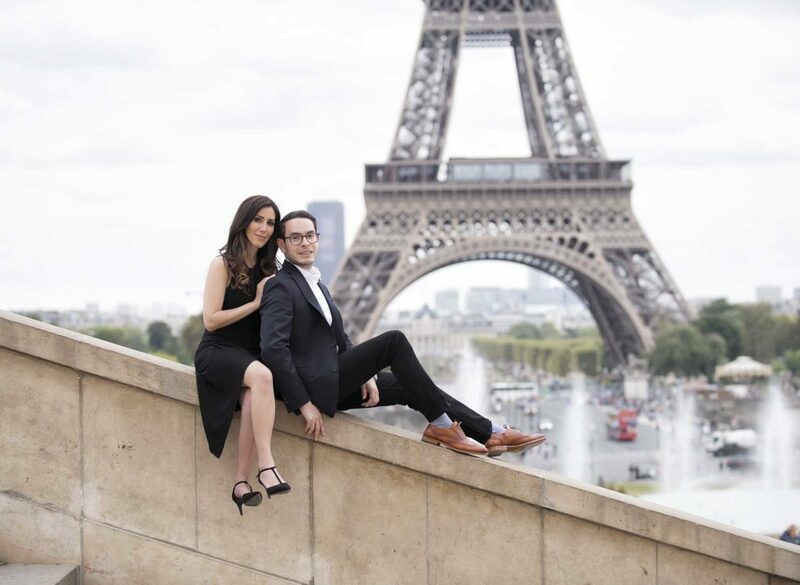 He had reached out to us to help him organize his proposal at the Eiffel tower! 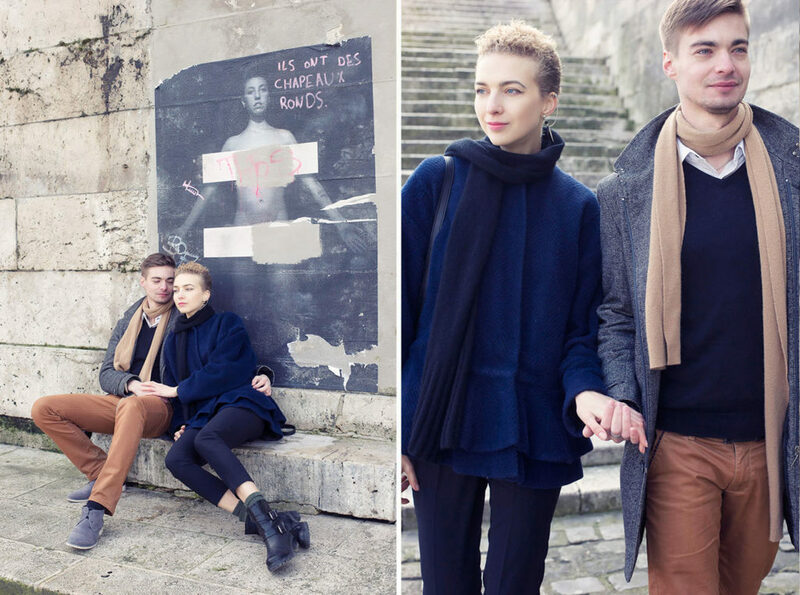 Great, this is exactly what we love doing most. 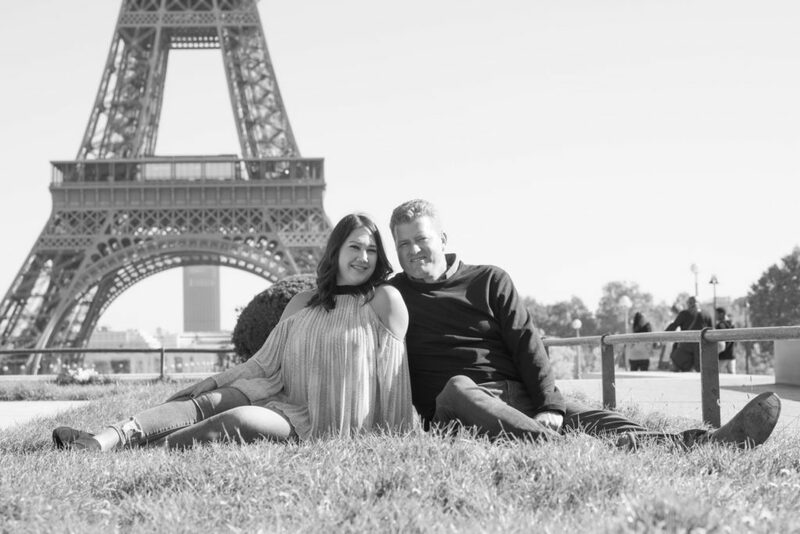 Those few words are taken from his first contact email to us; ” I’m very nervous about the whole thing and have no idea how any of it would work. 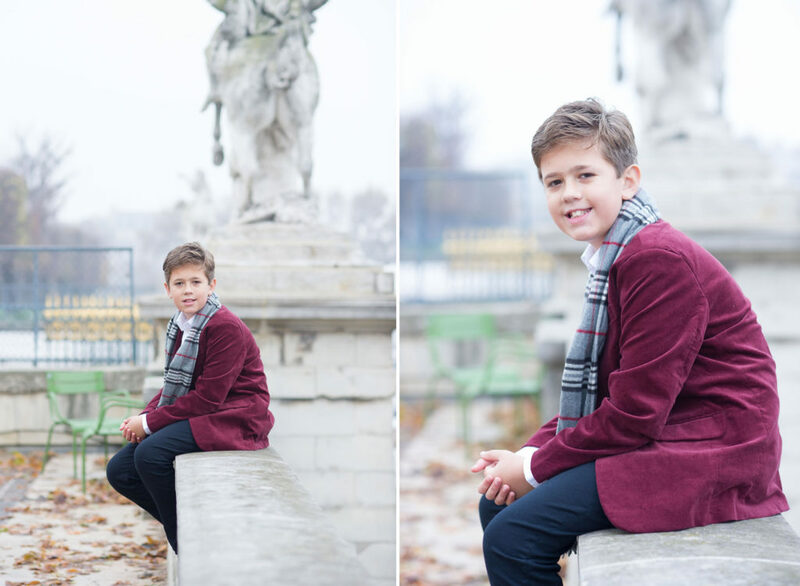 ” I smile because it is quite often that we receive this kind of message. 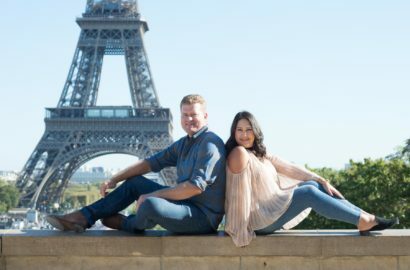 We have somehow, quite unintentionally made it a specialty to cater for men looking for the perfect way to propose to their girlfriends while visiting Paris. 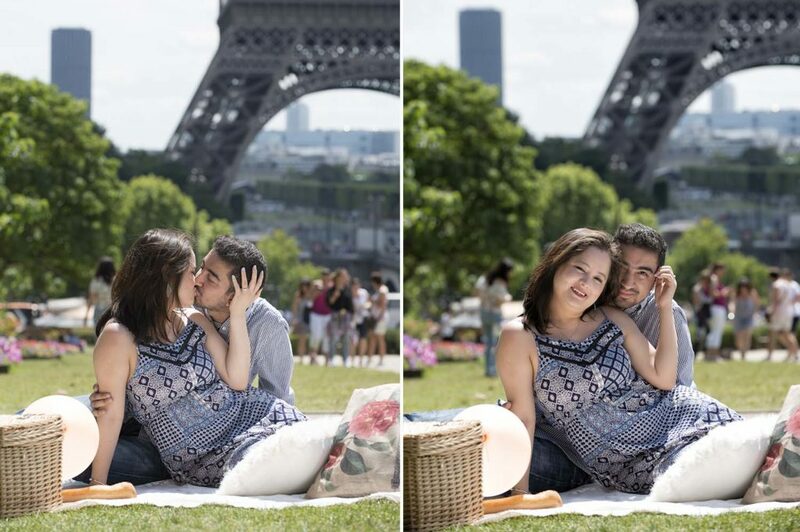 And let me tell you; a gourmet picnic overlooking the Eiffel tower definitely rocks and is utterly romantic. 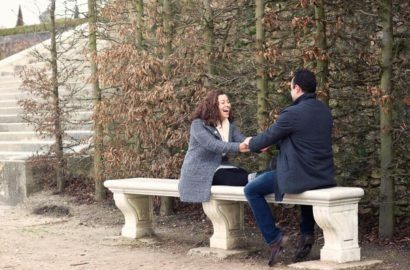 We had our photographer discretely photograph the proposal from the distance. 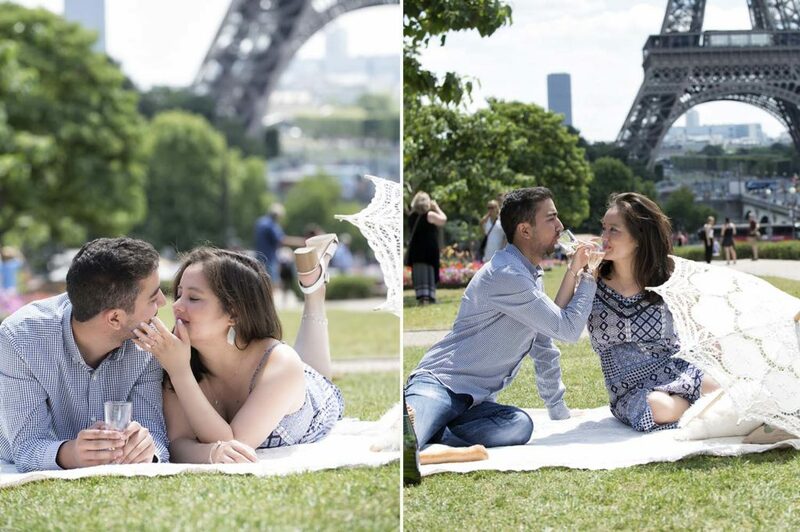 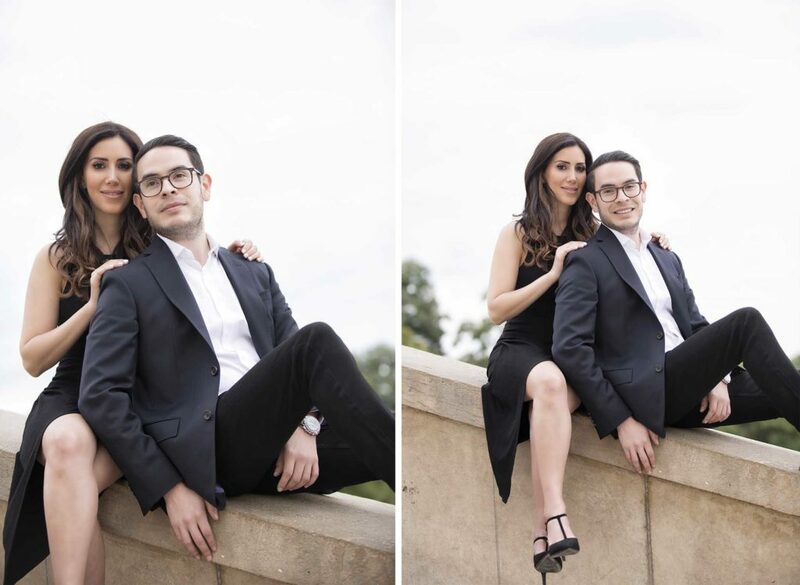 Once Sepehr had proposed to his girlfriend, Olivier introduced himself and took a few more photographs at the picnic location while they opened the bottle of champagne. 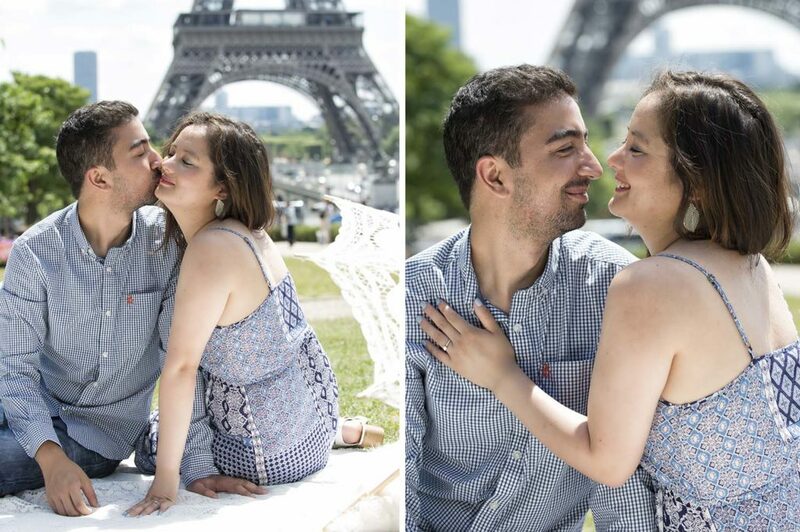 Sepehr and Hinu then enjoyed their gourmet picnic overlooking the Eiffel tower for a good hour and half. 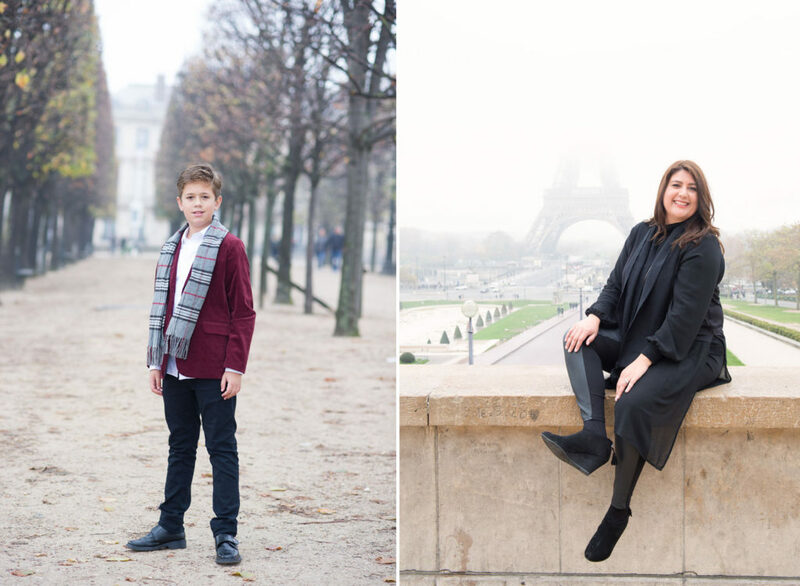 Olivier took them for a few more photographs around the Trocadero before they rushed to gare du Nord heading back to London. 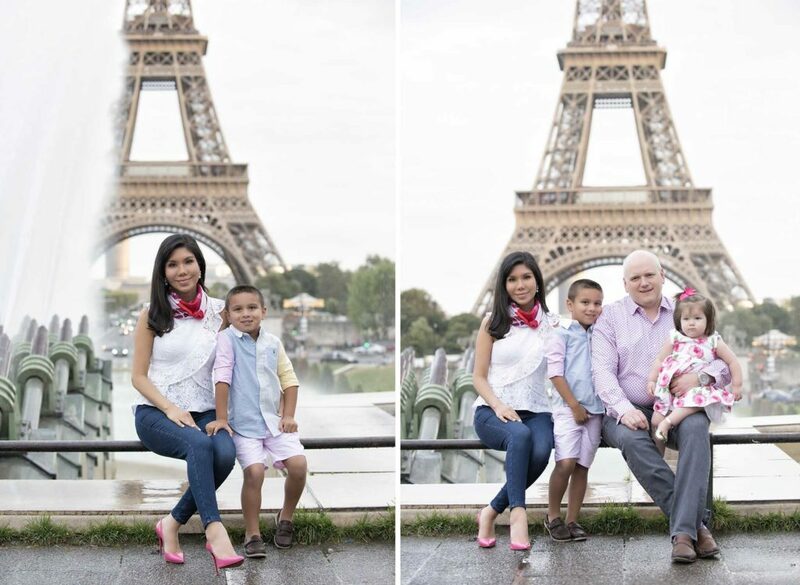 By the time they arrived home, Olivier had edited and retouched a selection of 40+ photographs that were sent out to them on the very same day. 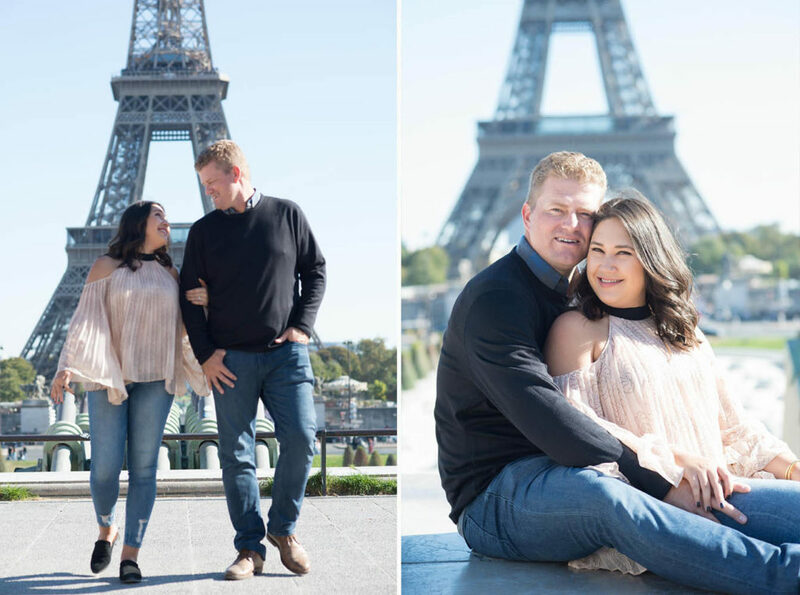 They had gorgeous memories of their trip to Paris and some beautiful photographs to send out to friends and family the next day. 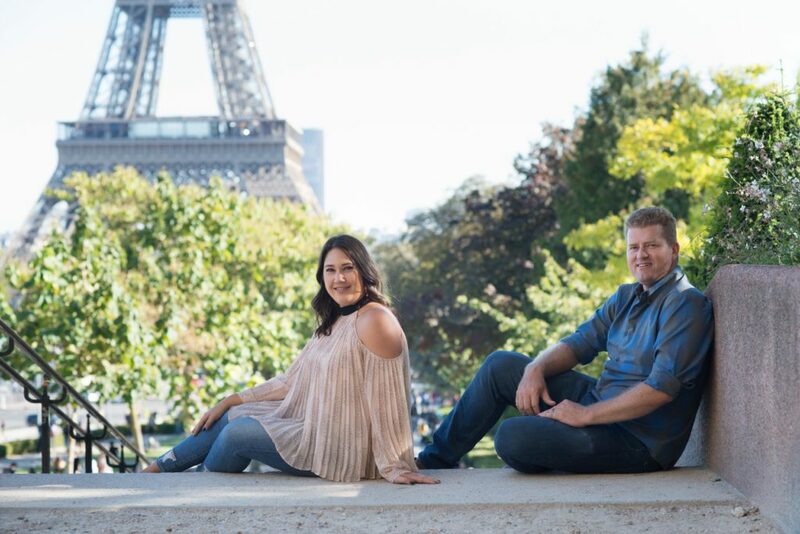 We have great clients and love what we do!